While the Black Hawk war was raging in 1832, the few settlers who remained to keep their homestead claims, built a fort in the present city limits of Joliet, which they called "Fort Nonsense." The fort was labeled “Fort Nonsense” because it was constructed without provision for obtaining basic necessities such as food, fuel, and fresh water. The fort was built on the homestead of Mr. Jesse Cook, which stood on a bluff overlooking the west side of the Desplaines River in today's Joliet, near the current site of St. Peter’s Lutheran Church and School at 310 N. Broadway Street. The fort was near the “old settler’s cave,” used for protection against Indians in the early settlement of the area. 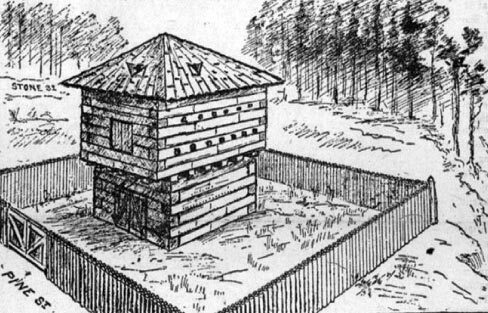 The fort was of the stockade order, approximately 100 square feet in size, with a blockhouse at the northeast corner and fenced in upright logs (vertically) set in the ground, and about eighteen feet high. The fort was torn down soon after it was built, but ironically, the blockhouse of Fort Nonsense was used as one of Joliet’s first schoolhouses. The first school was taught in Mr. Reeds cabin in the winter of 1832. For the 1833 school year, Miss Persis Cleveland taught school in the Fort Nonsense blockhouse. Fort Piggott, Piggott's Ferry and a brief history of James Piggott. James Piggott took the long view regarding the development of Illinois territory. Born in Connecticut, his fortunes took him further west throughout his life. He served in the Revolutionary War as a member of the Eighth Pennsylvania Regiment. After his military service he joined George Rogers Clark recruiting families to live in the proposed town of Clarksville, close to present day Wickliffe, Kentucky. Chickasaw Indians forced the abandonment of this endeavor in 1782. Piggott and family settled in Columbia, Illinois, in 1783. During that time, the area was swampy and uninhabited. To get to St. Louis from the Illinois side, you'd have to start from Cahokia and go North, up the Mississippi, against the current, to get to St. Louis. Piggott had a brilliant idea. He laid a planked road from Columbia to a low point on Cahokia Creek. Then he built a 150-foot wood bridge over the creek so goods could get to his ferry landing. 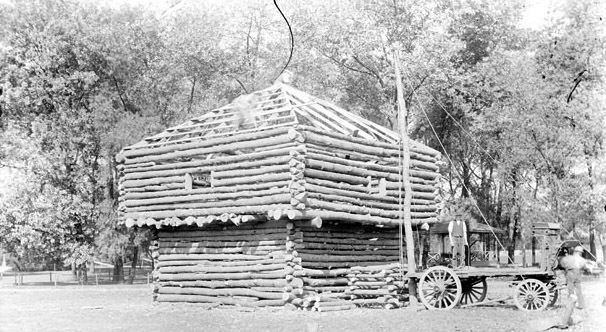 Piggott and seventeen families built cabins and a blockhouse just west of modern day Columbia. Fort Piggott, or as it was sometimes called; Fort Big Run. (It was Piggott’s wish to change the name of the town to “Big Run.”) James Piggott erected this fort in 1783 at the foot of the bluff, one and one half miles west of Columbia. 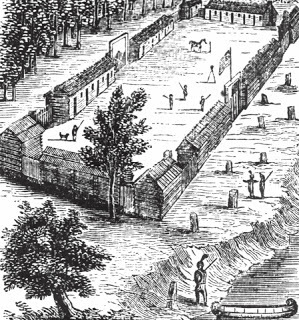 A drawing of Fort Boonesboroug, Kentucky - Fort Piggott was yet another look-a-like. The fort was located on what was known as Carr Creek, which the French called "Grand Risseau" (literal translation: large gully). The creek was named for Lenard Carr, an early settler. James Piggott fought with George Washington in the Battle of the Brandywine. As Indian depredations increased, the Fort became a safe-haven for the settlers. When word went out to summon the settlers to the fort it was said that even the children realized the danger. In 1783 there were forty six inhabitants living at Fort Piggott. Indian killings accelerated during 1789 and 1790; no one was safe. Indeed, one-tenth of the population was killed by the Indians. Assenath Piggott, James Piggott's daughter, was born on January 17, 1791 within Fort Piggott, St. Clair County, Illinois. The growth of St. Louis encouraged the development of the Illinois side of the Mississippi River. Demand to ferry to St. Louis increased. In 1795 Piggott opened a ferry service which quickly became a central point for travelers and goods. The ferry transported people, animals, carts, wagons, and goods directly to the St. Louis docks. The area around the dock, developed very quickly. Piggott faced competition from other entrepreneurs interested in capturing some of the ferry business. The location of Piggott's Ferry complex in 1795. After James Piggott died in 1799, the ferry continued operation by his sons. The McKnight-Brady operation invested in Piggott's ferry. Eventually was sold to the Wiggins Ferry monopoly. They platted the land behind the Piggott ferry in 1818 and named it Illinoistown. Looking Northeast at the intersection of 107th and Halsted at an 1840s sod house in Chicago. This photograph, shot sometime in the 1920s by a Daily News photographer, was known as a sod house. More common than you might think, this house was probably built while homesteading in 1840s Chicago. 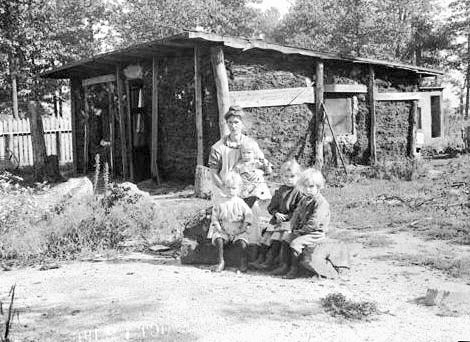 Many families lived like this in the new frontier of the 1800s. The sod house or "soddy" was a successor to the log cabin during frontier settlement of the United States. The prairie lacked standard building materials such as wood or stone; however, sod from thickly-rooted prairie grass was abundant. Prairie grass had a much thicker, tougher root structure than modern landscaping grass. Construction of a sod house involved cutting patches of sod in rectangles, often 2'×1'×6" and piling them into walls. Builders employed a variety of roofing methods. Sod houses accommodate normal doors and windows. The resulting structure was a well-insulated but damp dwelling that was very inexpensive. Sod houses required frequent maintenance and were vulnerable to rain damage. Stucco or wood panels often protected the outer walls. Canvas or plaster often lined the interior walls. The Eleven Mile House Tavern at 92nd and State Streets in Chicago, 1879. 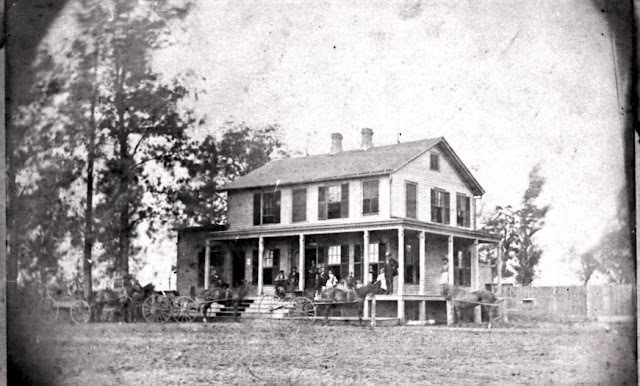 The Eleven Mile House Tavern was built in 1838 at 92nd and State Streets in Chicago. Photographed in 1879. According to legend, Aurora's Senator Henry Evans wanted to build an interurban line from Aurora to Morris and connect with his friend's line, Senator McKinley's Illinois Traction System. Senator Evans was the man who had organized the Aurora City Railway Company in 1882 and began streetcar service with mule-drawn cars which were quickly converted to electric cars beginning in 1890. During the 1890's, he also built many buildings in Aurora. By the mid-1890's, streetcar lines in Aurora and Elgin were flourishing. Sections of interurban lines were being built to connect the two cities. There were rumors of a major interurban line to be built from Aurora to Chicago which would in later years become the Chicago Aurora & Elgin Railroad. By the late 1890's, "interurban fever" was gripping the Midwest, and during April of 1897, Senator Evans incorporated his line to run south from Aurora - the Aurora, Yorkville & Morris Railway Co. Within three months Senator Evans had secured the necessary franchises to run in and along the roads as far south as Montgomery and was buying land to continue south. However, there was "a hitch" in his plans. The best route from Montgomery to Oswego was through a particular farmer's field, and that farmer did not want to sell a narrow strip for a railroad to cut through the middle of his farm. After haggling with the farmer and threatening condemnation and lawsuits for nearly two years, Senator Evans finally gave up trying to buy just the narrow right of way and bought the whole farm! The next question was what to do with the land. It had open areas which could be turned into ball diamonds and campgrounds. The farm had a nice stand of trees along the Fox River and a bubbling clear water spring. The Fox River ran clearly and slowly by the banks and there was an island not too far off shore. 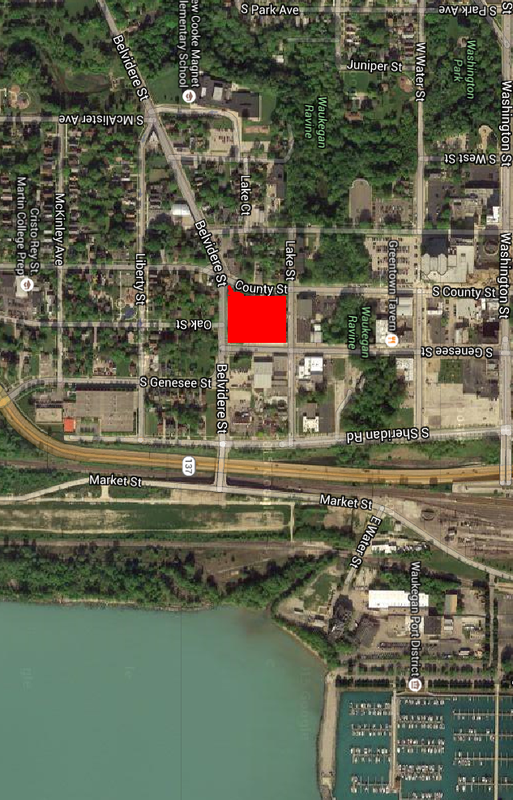 What an ideal location for a park - Riverview Park! Construction began during the summer of 1899 on both the park and the interurban line running south out of Aurora. Senator Evans didn't order any cars for his new company, but he contracted for service with his Aurora Street Railway Co. 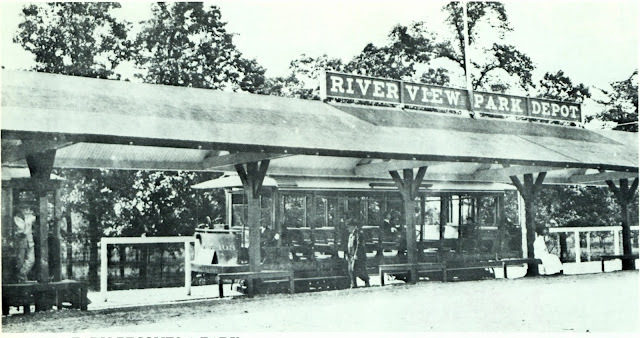 The Riverview Park depot had room for several cars to load and unload passengers all at once. Here, car 103, a double-truck 12-bench open car built by the J. G. Brill Company in 1897, waits for returning passengers after a day of fun at the park. 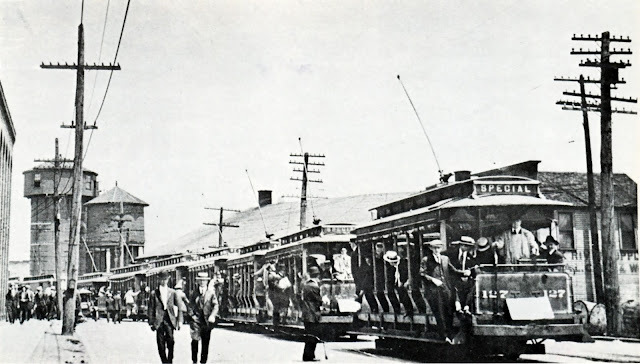 The cars begin arriving at the raised platform depot at Riverview Park in this photo from 1900. 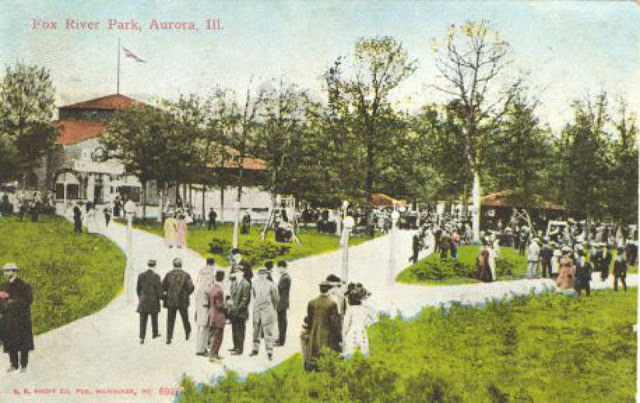 Rather than wait until the following spring, Riverview Park was opened when streetcars left Aurora to run as far south as the park. The day was Tuesday, November 7, 1899, and the first cars were operating at 1:00 p.m. Montgomery was decorated with flags and the people were out to welcome the first train. Four cars were running in each direction by 2:00 p.m. when about 500 people were present for the dedication of Riverview Park. The transfer is almost complete as the streetcars are lined up on north Broadway in front of the CB&Q's roundhouse and shops waiting for the "go ahead" signal for the short trip to the park. Senator Evans was disappointed that the brass band which had been hired for the occasion didn't show up, but - as the Aurora Daily Beacon story put it - "there was plenty of music in the air when the oratory was on." In a short talk, Mayor Howard said, "This beautiful spot is to be a prohibition park, and if anyone drinks liquor here, he will have to bring it in his clothes. It will be a credit to Aurora and Montgomery," he added. More addresses followed and later in the day, Goddard's string band furnished music for dancing. The midway was alive with people in this photo from about 1908. The 1907 consolidation and refurbishing had been completed and a new front had been added to the dance hall in the center, background. The entrances to the Figure 8 and Roller Coaster and other midway activities were behind the lighted facades to the right. 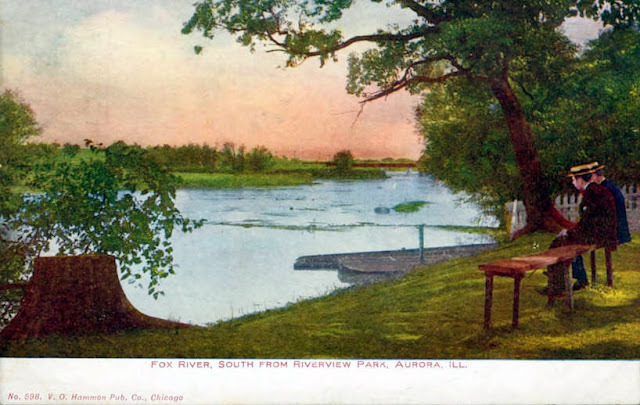 By early summer of 1900, the Aurora & Geneva Railway completed the final segment in the line from Elgin to Aurora, opening up more opportunities for direct streetcar connections to Riverview Park. A month later the Aurora, Yorkville & Morris R y. reached Oswego and by December had completed its line to Yorkville. This tapped a rural population that would ride the Interurbans to Riverview Park for picnics, boating, Chautauquas and other amusements. There were many special outings at the park each summer. 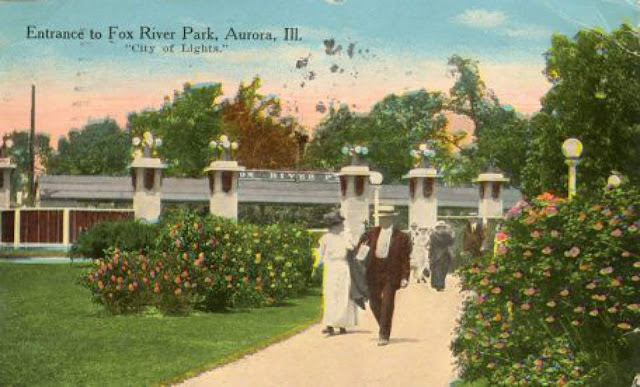 According to the Aurora Daily News, employees of the Chicago Corset Company (Aurora) had everything "their own way" at Riverview Park when they enjoyed their second annual complimentary picnic. The company chartered ten special cars, besides all the smaller ones. The employees loaded on at the factory and were taken directly to the park. "All the privileges were leased exclusively for them and no one else was allowed to intrude, so they had the best kind of time. Dinner was a grand affair - when all spread out it was a grand picture. A fine literary and musical program was given by Mrs. Emma Skinner-Miller, Huen's full band furnished the band music, and a parade and dance representing all nations was an interesting feature. Barrels of lemonade were at several prominent places on the grounds; ice cream, sandwiches and other refreshments were served in great abundance for the evening lunch." The Aurora, Elgin & Chicago Railway began operating from Chicago to Aurora during August of 1902. 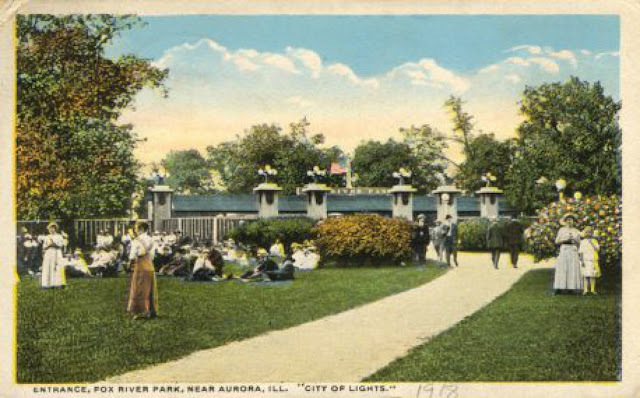 This opened up the vast Chicagoland area to Riverview Park via a connection between the "Third Rail" interurban line and the Aurora streetcar line in downtown Aurora. No admission was charged and accommodations were provided for automobiles and other vehicles. A 5¢ fare was charged on the company's cars which ran every half hour from Aurora to the park. Special excursions were run to the park throughout the summer months. The Electric Railway Journal of 1913 reported that the AE&C provided 40 special cars to carry 2500 people from Chicago for a company picnic in August, 1913. To handle such large groups, passengers would board the AE&C's third-rail interurban cars in Chicago for the trip to Aurora where the riders would transfer to smaller city streetcars. 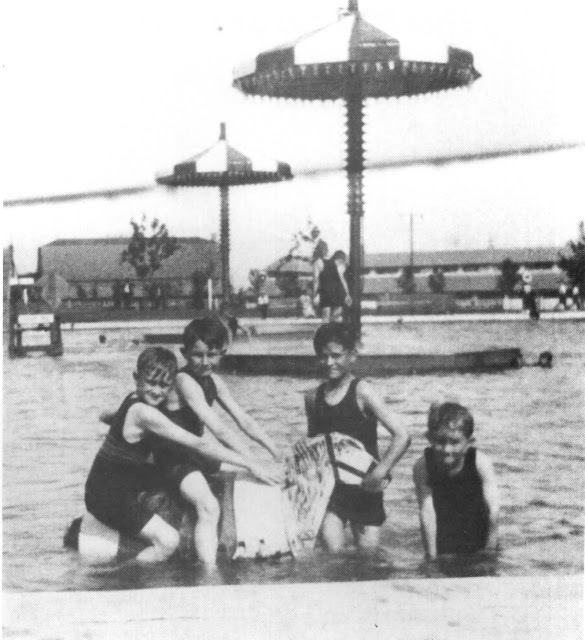 Riverview Park had many attractions including a roller coaster, auditorium for theatrical and stage shows, a dance hall, restaurant, and a merry go round, to name a few. But the natural beauty of the area is what attracted the first visitors. A spacious park atmosphere greeted visitors as they walked through the main gate with the busy activity of the amusements in the background. According to a brochure about the park, it was heavily wooded, and "from a high elevation slopes gradually down to the river, which at this point is very wide and is studded with several islands. Looking up the river towards Aurora is a splendid view, and opposite the park is a beautiful hill country. In several places streams break through between the hills and trees making some picturesque spots. 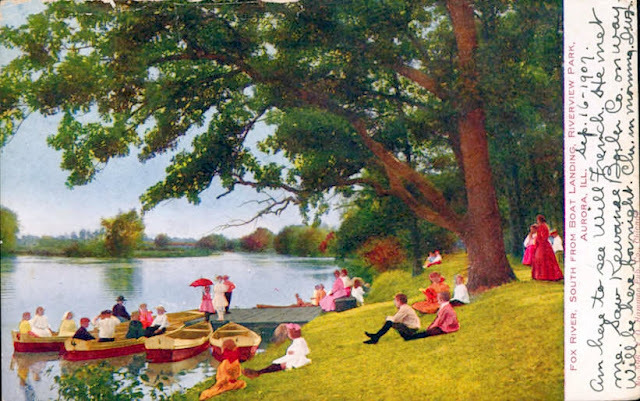 A fine drive on the east side of the river, following to the south, is well patronized on pleasant days, and strung all along the banks are parties fishing and picnicking, or indulging in the shade, enjoying the scenery and watching the sports going on about the river." "To the south is probably the most beautiful scene - about a quarter of a mile down the river is spanned by the railroad bridge. The wooded islands in front and the grand old oaks, looking out from the park over and down the river, make a lovely picture worthy of the palette of the greatest master." From the west end on high ground of the park, farm lands, wooded timber lands, streams and pastures with cattle and sheep can be seen "as far as the eye can reach." "The scenery here at sunset is especially enchanting, looking over the rich farm country for several miles; and the sun setting between the trees adds to the scene, making it one of the beautiful spots of the park. Parties enjoy this quiet part for their evening lunch; tables and seats for various sized parties are arranged at almost every shaded nook, with electric lights for the evening adding greatly to the comfort of the evening visitors." There was an artesian spring on the grounds which furnished constantly flowing pure water. There was considerable talk of the water having medicinal qualities, and Senator Evans even promoted the establishment of a sanitarium nearby for the purpose of using the mineral water for "healthful and curative purposes". However, nothing ever came of the plan and special pipes were installed to bring up the water, under its own pressure, to a pleasant drinking fountain level. By the grand opening in the spring of 1900, several structures were completed. They included a three arch entrance, the station, a dance hall, refreshment hall, bandstand, Chute-the-Chutes, merry go round and swings for children, plus a baseball diamond. The triple arch entrance was at the north end of the park because the vast majority of visitors traveled to the park from the north. The arched entryway was built of wood studs and siding and actually spanned the single track mainline of the Aurora-Oswego line. The western portal was fenced, while the eastern portal was a gate constructed of the same wooden fencing material. 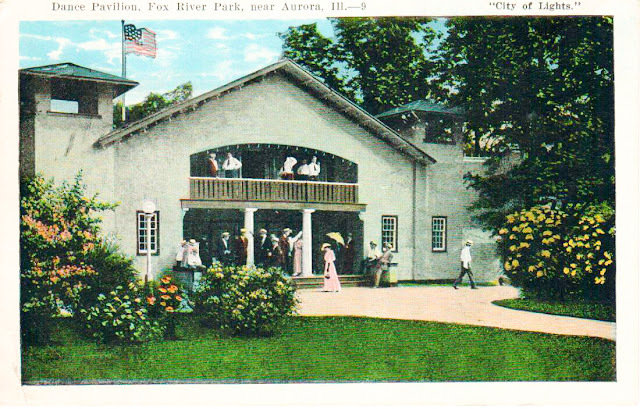 Fox River Park Dance Pavilion. The station platform, raised about two feet off the ground, was constructed of wood and was well over 100 feet long - long enough to easily accommodate half a dozen cars. 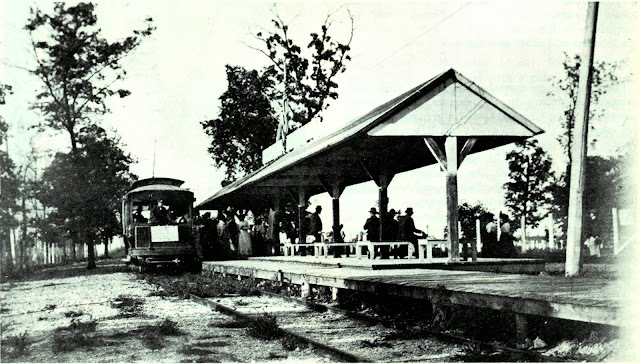 A portion of the platform was covered by a wooden canopy constructed to normal railroad waiting platform guidelines. Under the canopy were simple wooden benches capable of seating approximately fifty people. A single track stub spur was installed toward the south end of the park in front of the ballpark which could easily accommodate ten or more cars waiting for the end of a game or special outing. The original dance hall was constructed of wood and was 62' x 114', large enough to accommodate hundreds of dancers. A park brochure said, "the floors have been carefully laid and have that desirable elasticity that is a delight to those who trip the light fantastic." It was lighted at night by electric lights. In addition, portable seating could be brought in for special events. Although usually left open, the dance hall could be enclosed on the sides by means of drop shutters. The refreshment or dining hall was 50'6" wide by 113' long and was built entirely of wood. On the south end of the building were two bays which were enclosed for a kitchen and living quarters. Only a part of the rest of the building was enclosed. 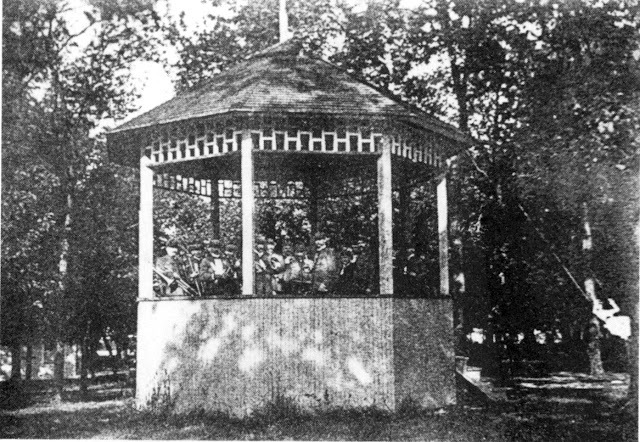 An eight-sided bandstand was built as part of the original compliment of buildings, but it was later removed to provide additional space for new buildings and to encourage customers to use the dance hall. 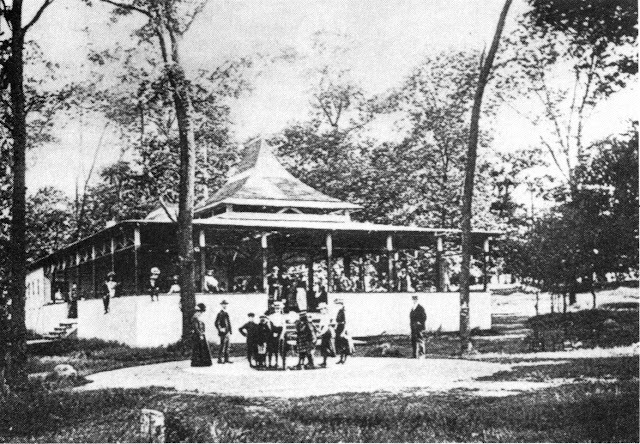 A new bandstand was incorporated in the later remodeled dance hall. The chutes, rather crude by modern standards, consisted of a double-track incline constructed of wood. A somewhat rectangular shaped flat-bottom boat was hauled to the top of the incline by a motor driven chain. The boat was moved over to the other sets of rails by an operator and the passengers, who had walked up steps to the top, were loaded into the boat. Once aboard, the operator's helper would climb in, too, and the boat would shoot off at an ever increasing speed into the river below. Once in the river, the boat had a tendency to float down river away from the park; the helper "poled" the boat back to the dock so that the now wet riders could get out. The Riverview Park Shoot-the-Chutes were crude even for those days. A flat bottom boat was pulled up the right track, moved over to the left track and was sent splashing down to the river to the thrill of the riders. One of the major amusements, "The Flying Dutchman", (merry-go-round) arrived in Aurora on March 30, 1903. The machine was so large that it required an extra-large freight car for the shipment of all the parts. The parts were quickly unloaded so that artists and painters were able to put the finishing touches on the merry-go-round to make it one of the finest in the country. A magnificent automatic organ, containing a program of some 20 pieces of up-to-date music, was a feature of the merry-go-round. All of the previously mentioned streetcar and interurban lines, plus Riverview Park, were consolidated into the Aurora, Elgin & Chicago Railroad Company in 1905. By 1907 the consolidation of the various companies had settled in and railroad operations were running smoothly. The management turned to thoughts of improving the park. The first step was the adoption of a comprehensive plan for development which would capitalize on the naturally attractive topographical features of the park. The main thoroughfare extended across the park from the entrance at the electric railway station to a bridge leading to a pavilion on a wooded island. The bridge to the island and the pavilion were proposed at the time of the map, but it seems that they never were built. All of the concessions and amusement features were arranged symmetrically on the thoroughfare. At the time of the reconstruction several of the buildings, already on the grounds, had to be moved at a cost of $1,000. In addition, a unifying theme was adopted, and the dining hall and dance hall were given entirely new entrances of 2"x6" studding and lathing covered with a stucco finish in the "mission" style of architecture. A new gateway was added which greeted visitors just as they got off the trolley cars and entered the grounds. They, too, were constructed of 2"x6" studding and covered with lathing and a stucco finish. They were adorned with a cluster of five lights within frosted spheres. Once within the gates, the visitor found several paths leading to a semi-circular thoroughfare around which the concessions were grouped. The plan of arranging the buildings in semi-circular form was chosen because it made the best impression on the incoming visitor. It was found to be desirable to keep the attractions grouped closely together because there was a tendency for a crowd to form and add to the enthusiasm. As new buildings were constructed from year to year, they were connected by an ornamental wall or peristyle of the same stucco finish. This was done so that the visitor, as he entered the park, was greeted by a complete semi-circle of amusement structures with ornamental connections. 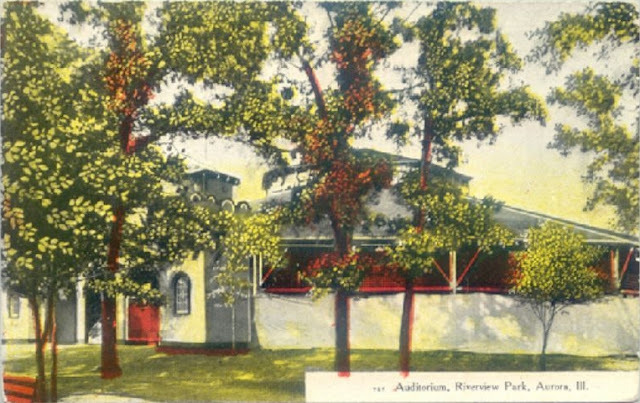 The great auditorium appears to have been built at this time since it was well planned and was the most solidly constructed building at Riverview Park. It had a steel frame, including latticed columns on concrete piers, steel trusses and purlins, wood roof sheathing, wood sash, and a shingled roof which was 135 feet in diameter. The sides of the auditorium were open to a height of 8½ feet, above which was wood lattice work. The entrance to the auditorium was constructed of wood, with its exterior walls covered with wood lath and cement plaster. At the east end of the auditorium were the stage and dressing rooms. The auditorium covered an area of 5,895 sq. ft. and had a seating capacity of 3,500 on a tanbark floor. The building housed a complete installation of theater properties, including dimmers and similar mechanisms for artificial lighting. By 1909 the following amusement features were operated from the semi-circle: Figure eight; Roller coaster - 3,000 feet long extending to the river bank and back to the circle; Dance hall; Restaurant; Auditorium; Merry Widow (swing); and Carousel. Other features included rental canoes and a paddle wheel boat ride on the Fox River. Most rides were 5¢ c and 10¢. At the south end of Riverview was the baseball park. From about 1907 to 1921, Riverview's ballpark was the scene of many exciting games played by the Wisconsin/Illinois League. The traction company furnished the field and stands and even money at times to help support the Aurora team. In the 1910-1915 era, the late Casey Stengel played with the Aurora team in the WI League. After the Fox & Illinois Union Railway was completed in 1915, special trains were operated from Morris for the baseball games. 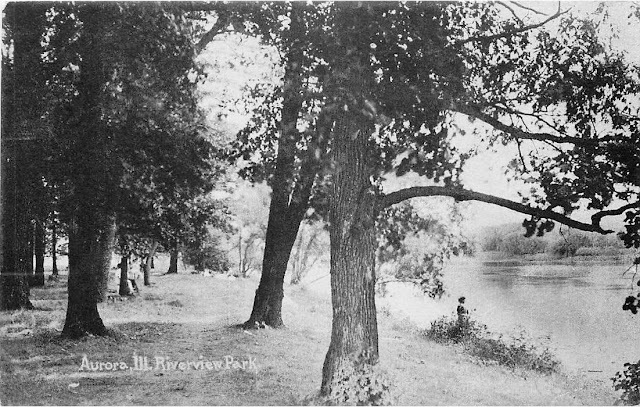 From the records available, it appears that the name of Riverview Park was changed to Fox River Park in 1910. This probably was done because of the rising prominence of Riverview Park in Chicago and to avoid the confusion that must have arisen. On December 13, 1912, Fox River Park was in danger of being destroyed by fire. High grass in the park had been set afire by tramps, and flames were spreading to the baseball area and other buildings in the park. Division Superintendent Moorman of the traction company was notified of the fire and appealed to the Aurora Fire Chief for aid. The Aurora Chief sent the Number 3 Automobile Truck Company to the park even though it was outside the city limits. Had it not been for the aid of the Aurora Department, the grandstands and bleachers in the ballpark and the buildings in the amusement area would have been destroyed. It appears that the years 1900-1915 were the best for Riverview Park and Fox River Park. Records show that as many as 40 special cars at a time would come to the park for special events hosting upwards of 5,000 people. The decline came quickly after the war. Local people had their own automobiles. They could go longer distances for their entertainment. The opening in 1922 of the Central States Fair and Exposition (Exposition Park 1922-1931) in North Aurora was probably "the last nail in the coffin." 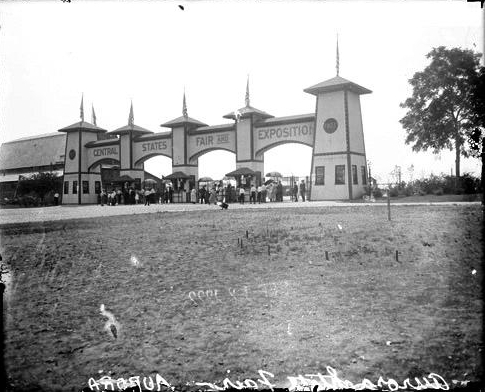 Exposition Park featured a large swimming pool, many amusements and a race track. 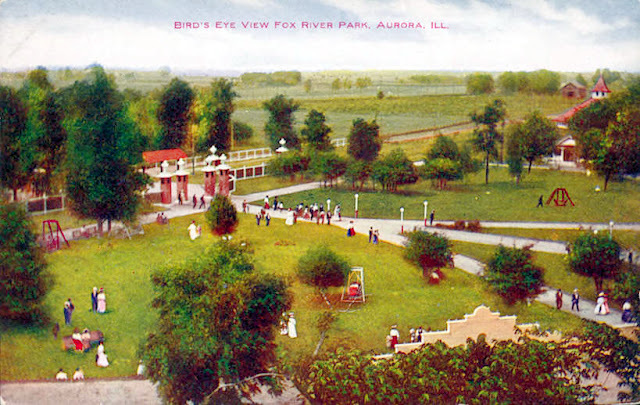 The ball fields at Exposition Park took away one of the major sources of revenue for Fox River Park. Finally, the interurban line to Yorkville was abandoned in January of 1925. It seems that Fox River Park was abandoned at the same time. For several years after the close of the park, the old entrance light stands could be seen overgrown with weeds. The auditorium, the last building remaining on the property, was dismantled in the late 1920's. In addition, the old Fox River line city cars were scrapped on the siding in the late '20's. Even after the park was closed, Boy Scout outings were held on the campgrounds. The property was later sold. Part of it was subdivided and a large factory was built on a portion of the site. In recent years the factory has become the Montgomery plant of the Western Electric Company. The company has managed to maintain some of the beauty of the former wooded park along the banks of the Fox River. In 1921, Frank Thielen sold much of his investment in Aurora theaters and formed the Northern Illinois Fair Association, later to be known as the Central States Fair and Exposition Park. 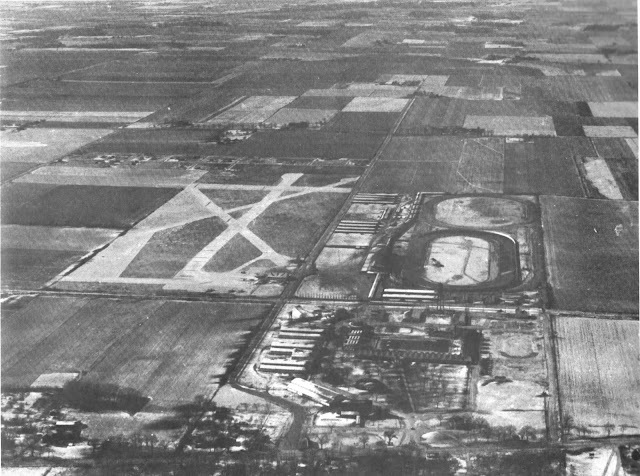 Founded on February 17, 1922, the 121 acre facility was located north of Aurora on North Lake Street Road (old Lincoln Highway). The facility grew to be one of the largest outdoor recreation centers in the Midwest. 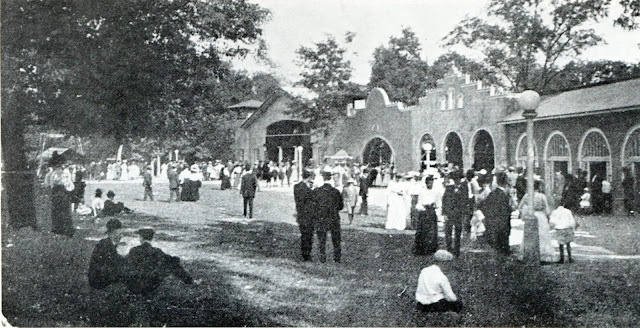 The park operated from Easter until late fall, with the summer months being the busiest period; particularly the months of August and September, when the Central States Fair was held. The fair brought in as many as 75,000 persons during its usual nine day run. Agricultural exhibits and competition were the focuses of the fair, but fireworks, special band concerts, horse racing, auto racing, drum corps, balloon ascensions, and other attractions were added to the already long list of entertainment options available regularly at the park. Front Entrance and Ticket Booth. Fireworks, auto and airplane stunt shows, daredevils, locomotive collisions, and countless other unique forms of entertainment brought visitors in droves. 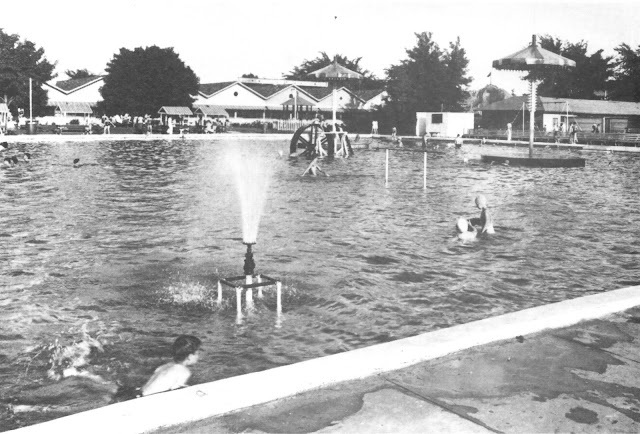 The park also hosted sporting events such as baseball, wrestling, football, horse racing, auto racing and rodeos. Picnicking was always popular at the park. Permanent offerings at Exposition Park included a 130 room hotel; the “world’s largest swimming pool,” measuring 320 feet by 160 feet; a race track with grand stand; a golf course; a beautiful pergola filled with imported flowers, birds and exotic animals; and a restaurant that later became a ballroom, roller skating rink and exhibit hall, situated in what was said to be the “world’s largest log cabin.” A “Kiddie Amusement Park” contained a roller coaster (the Exposition Flyer); tilt-a-whirl; Ferris wheel (the “Swooper”); a pony track; the House of Fun; “Monkey Island” with live monkeys; the “Ol’ Mill” boat rides; a penny arcade; “Leapin’ Leana” children’s playground; a miniature railroad (the “Exposition Limited’) and other attractions. The largest crowds lasted throughout the 1920s, but depression years saw declining attendances. The Fair was ended after 1931, but the park remained opened on a limited scale until World War II. During the war, many of the buildings were used to house military goods. The merry-go-round and miniature railroad were sold to Chicago’s Riverview Park, and in 1957, the park was demolished to make room for new development. 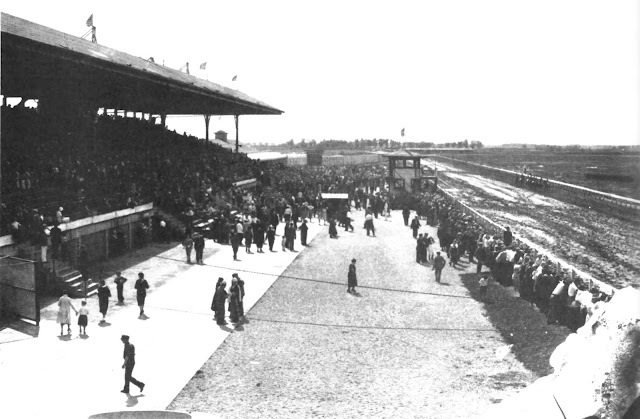 The Exposition park race track was revived as Aurora Downs but was not long lived. 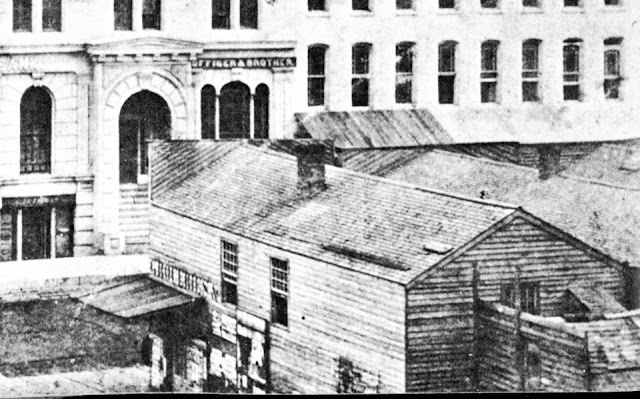 This is a balloon frame building on the Southeast corner of Lake and LaSalle streets across from the Marine Bank building in 1856. The balloon frame structure built c.1845. The above ribbon one is a Memoriam ribbon which was worn by people shortly after Lincoln’s assassination in April 1865; he was fifty-six years old. The ribbon above was worn by people commemorating the 100th Anniversary of Abraham Lincoln’s birthdate of February 12, 1809. The Ordinance of 1787 and Old Northwest Territory. The Ordinance of 1787 and Old Northwest Territory. 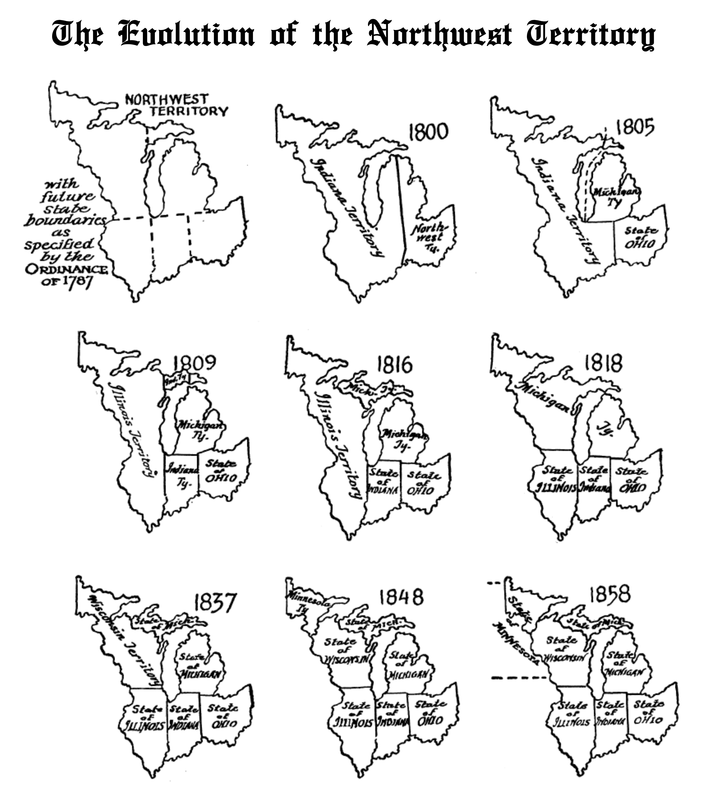 This series of maps gives a capsular explanation of the evolution of the old "Northwest Territory" into the six states of Ohio, Indiana, Illinois, Michigan, Wisconsin and Minnesota. Willard F. Myrick (1809-1889), a brief biography of a Chicagoan. Willard F. Myrick arrived in Chicago in October of 1836 from the shores of Lake Champlain, Vermont, where he was born. 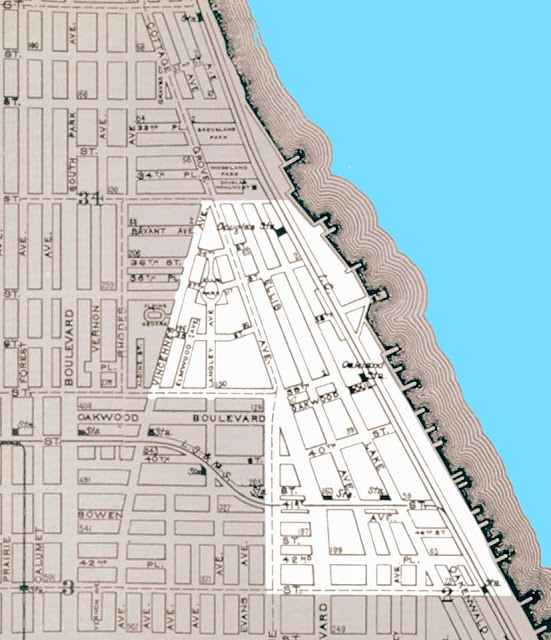 Soon after his arrival in Chicago, he bought 70 acres on the lakefront between the present 35th and 43rd streets. 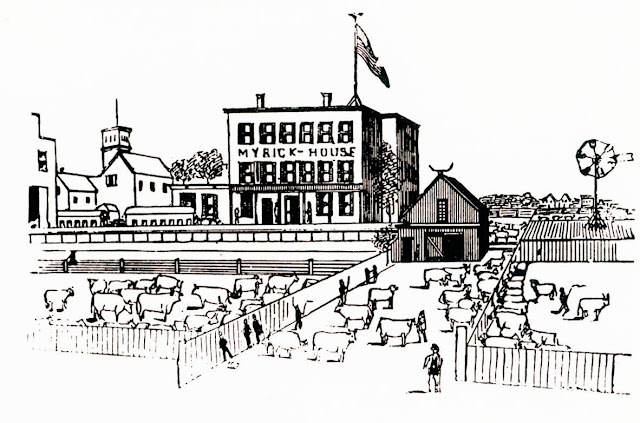 Myrick's stockyard on 28th Street is an ancestor of Union Stock Yards. He opened "Myrick's House" in 1839 which was a noted stop for drovers and cattlemen to buy food and drinks and enjoy shadier entertainments. Over the next few years Myrick added a hotel, barrack style apartments, a betting parlor and a racing track at 29th and Cottage Grove. All flourished in the rapidly growing city, often to the dismay of respectable citizens. The drawing depicts Myrick's operation in the mid-1840s. Chicago's first census shows 398 dwellings, grocery and provisions stores and 29 (green) groceries. Taverns outnumbered churches but not lawyers. In 1854 John B. Sherman bought it and expanded the operation. All the local stockyards were eventually acquired by Sherman and consolidated to form the massive Union Stockyards in 1865. Myrick Avenue, now Vernon avenue, was named after Willard F. Myrick. Myrick is buried in the Oak Woods Cemetery, Chicago. 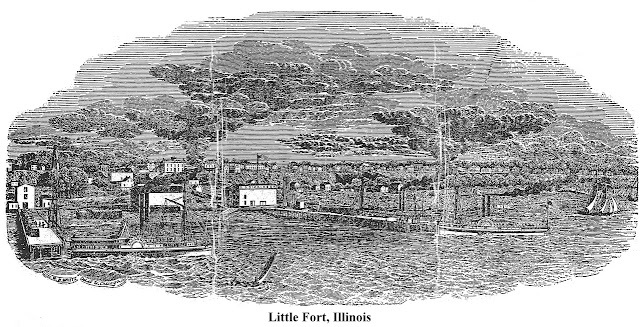 The "Little Fort" and the Lost Town of Illinois; Little Fort, now Waukegan, Illinois. A number of small, temporary fortified trading posts were constructed by the French in the late seventeenth and early eighteenth centuries in what would be the Chicago and collar counties today. The exact location of most of these trading posts is uncertain, and, although they were sometimes referred to as "forts," there is no evidence of permanent French military fortifications in the area during this period. In the early 1700s, the Potawatomi took over this region from the Mascoutens and the Miamis tribes. The area (and any possible forts) was abandoned by the French in the 1720s during the Fox Wars. It was customary for the Indians to burn down the Europeans' forts and posts after their triumphs, unlike Europeans who would take over the fort and often rename it. In the early 1700s, the Potawatomi took over this region from the Mascoutens and the Miamis tribes. The area (and any possible forts) was abandoned by the French in the 1720s during the Mesquakie (Fox) Wars. It was customary for the native peoples to burn down the Europeans' forts and posts after their triumphs, unlike Europeans who would take over the fort and often rename it. About the Little Fort Settlement; Today's Waukegan, Illinois. First visited by Father Jacques Marquette in 1673, Waukegan is one of the oldest communities in Illinois. The site was recorded as Rivière du Vieux Fort ("Old Fort River") and Wakaygagh on a 1778 map by Thomas Hutchins. The settlement started as a french trading post by a Potawatomi village sometime in the late 1600s. The French name was "Small Fort River" as translated from French to English. The settlement became known as "Little Fort." 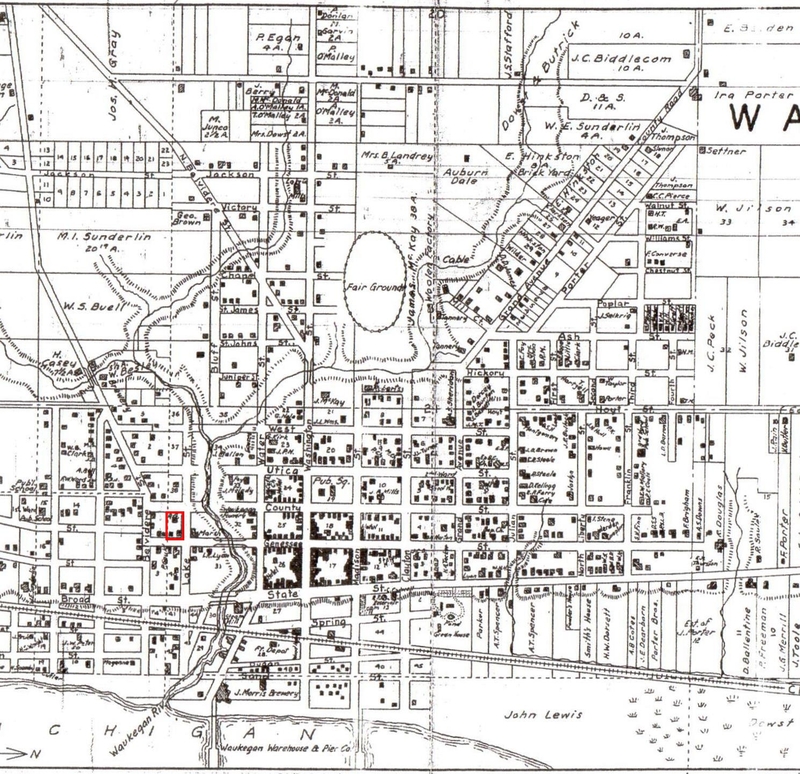 Plat Map of "Little Fort" the City of Waukegan created in 1861 showing the block where the Little Fort actually stood in red. Click map for full size view. On the 1861 plat map the original blocks were numbered. On the section of the map above, the original "Little Fort" sat to the right of the dotted line, with the red arrow pointing to block 39. You can see block 38 above it and block 40 below. The left half, on the other side of the dotted line, is an addition to “Little Fort” at a later time and numbered within that addition. Records dating back to 1829 tell of the Treaty of 1829 signed by the United Nations of the Potawatomi, Chippewa, and Ottawa tribes in which they ceded all of their land in this area to the federal government. Proud of the growth of their community and no longer wanting to be characterized as "little," the name "Waukegance" and then "Waukegan" (meaning "little fort"; from Potawatomi, Wakaigin "fort" or "fortress") was created by John H. Kinzie (John Kinzie's son) and Solomon Juneau, and the new name was adopted on March 31, 1849. Above and below are current map sections showing where the "Little Fort" was with a red overlay. Treaty of July 29, 1829 - Ratified on January 2, 1830. Articles of a treaty made and concluded at Prairie du Chien, in the Territory of Michigan, between the United States of America, by their Commissioners, General John McNeil, Colonel Pierre Menard, and Caleb Atwater, Esq. and the United Nations of Chippewa, Ottawa and Potawatomi Indians, of the waters of the Illinois, Milwaukee, and Manitoouck Rivers. The aforesaid nations of Chippewa, Ottawa, and Potawatomi Indians, do hereby cede to the United States aforesaid, all the lands comprehended within the following limits, to wit: Beginning at the Winnebago Village, on Rock river, forty miles from its mouth, and running thence down the Rock river, to a line which runs due west from the most southern bend of Lake Michigan to the Mississippi river, and with that line to the Mississippi river opposite to Rock Island; thence, up that river, to the United States' reservation at the mouth of the Wisconsin; thence, with the south and east lines of said reservation, to the Wisconsin river; thence southerly, passing the heads of the small streams emptying into the Mississippi, to the Rock River aforesaid, at the Winnebago Village, the place of beginning. And, also, one other tract of land described as follows, to wit: Beginning on the Western Shore of Lake Michigan, at the northeast corner of the field of Antoine Ouilmette, who lives near Gross Pointe, about twelve miles north of Chicago; thence, running due west, to the Rock River, aforesaid; thence, down the said river, to where a line drawn due west from the most southern bend of Lake Michigan crosses said river; thence, east, along said line, to the Fox River of the Illinois; thence, along the northwestern boundary line of the cession of 1816, to Lake Michigan; thence, northwardly, along the Western Shore of said Lake, to the place of beginning. In consideration of the aforesaid cessions of land, the United States aforesaid agree to pay to the aforesaid nations of Indians the sum of sixteen thousand dollars, annually, forever, in specie: said sum to be paid at Chicago. And the said United States further agree to cause to be delivered to said nations of Indians, in the month of October next, twelve thousand dollars worth of goods as a present. And it is further agreed, to deliver to said Indians, at Chicago, fifty barrels of salt, annually, forever; and further, the United States agree to make permanent, for the use of the said Indians, the blacksmith's establishment at Chicago. For Wau-pon-eh-see, five sections of land at the Grand Bois, on Fox River of the Illinois, where Shaytee's Village now stands. For Shab-eh-nay, two sections at his village near the Paw-paw Grove. For Awn-kote four sections at the village of Saw-meh-naug, on the Fox River of the Illinois. There shall be granted by the United States, to each of the following persons, (being descendants from Indians,) the following tracts of land, viz: To Claude Laframboise, one section of land on the Riviere aux Pleins, adjoining the line of the purchase of 1816. To Francois Bourbonné, Jr. one section at the Missionary establishment, on the Fox River of the Illinois. To Alexander Robinson, for himself and children, two sections on the Riviere aux Pleins, above and adjoining the tract herein granted to Claude Laframboise. To Pierre Leclerc, one section at the village of the As-sim-in-eh-Kon, or Paw-paw Grove. To Waish-kee-Shaw, a Potawatomi woman, wife of David Laughton, and to her child, one and a half sections at the old village of Nay-ou-Say, at or near the source of the Riviere aux Sables of the Illinois. To Billy Caldwell, two and a half sections on the Chicago River, above and adjoining the line of the purchase of 1816. To Victoire Pothier, one half section on the Chicago River, above and adjoining the tract of land herein granted to Billy Caldwell. To Jane Miranda, one quarter section on the Chicago River, above and adjoining the tract herein granted to Victoire Pothier. To Madeline, a Potawatomi woman, wife of Joseph Ogee, one section west of and adjoining the tract herein granted to Pierre Leclerc, at the Paw-paw Grove. To Archange Ouilmette, a Potawatomi woman, wife of Antoine Ouilmette, two sections, for herself and her children, on Lake Michigan, south of and adjoining the northern boundary of the cession herein made by the Indians aforesaid to the United States. To Antoine and Francois Leclerc, one section each, lying on the Mississippi River, north of and adjoining the line drawn due west from the most southern bend of Lake Michigan, where said line strikes the Mississippi River. 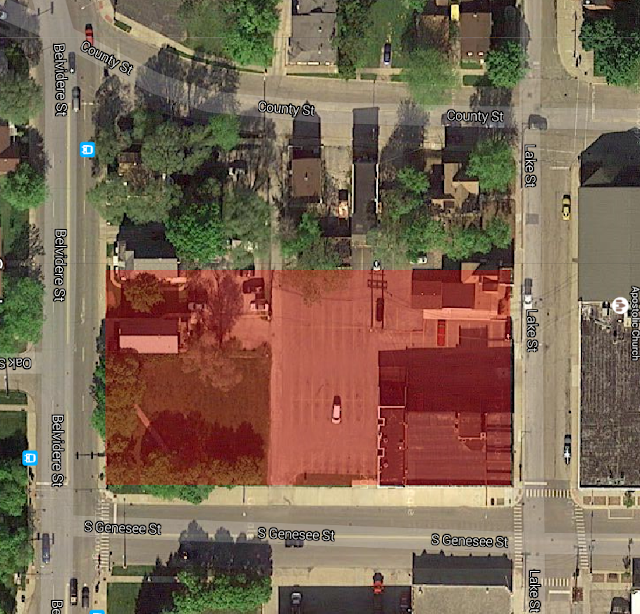 To Mo-ah-way, one quarter section on the north side of and adjoining the tract herein granted to Waish-Kee-Shaw. The tracts of land herein stipulated to be granted, shall never be leased or conveyed by the grantees, or their heirs, to any persons whatever, without the permission of the President of the United States. The United States, at the request of the Indians aforesaid, further agree to pay to the persons named in the schedule annexed to this treaty, the sum of eleven thousand six hundred and one dollars; which sum is in full satisfaction of the claims brought by said persons against said Indians, and by them acknowledged to be justly due. And it is further agreed, that the United States shall, at their own expense, cause to be surveyed, the northern boundary line of the cession herein made, from Lake Michigan to the Rock River, as soon as practicable after the ratification of this treaty, and shall also cause good and sufficient marks and mounds to be established on said line. The right to hunt on the lands herein ceded, so long as the same shall remain the property of the United States, is hereby secured to the nations who are parties to this treaty. This treaty shall take effect and be obligatory on the contracting parties, as soon as the same shall be ratified by the President of the United States, by and with the advice and consent of the Senate thereof. Be it enacted by the People of the State of Illinois, represented in the General Assembly, That the resident inhabitants of the Town of Little Fort, in Lake County, arc hereby constituted a body politic and corporate, to be known by the name of "the President and Trustees of the Town of Little Fort, and by that name shall be known in law, and have perpetual succession, may sue and be sued, plead and be impleaded, defend and be defended, in courts of "law and equity, and in all actions and matters whatsoever : may grant, purchase, receive and hold real and personal property within the limits of said Town, and no other, (burial grounds excepted,) and may lease, sell, and dispose of the same for the benefit of the Town, and may have power to lease any of the reserved lands, which have been or may be appropriated to the use of said Town, and may do all other acts as natural persons, which may be necessary to carry out the powers hereby granted, and may have a common seal and alter the same at pleasure. 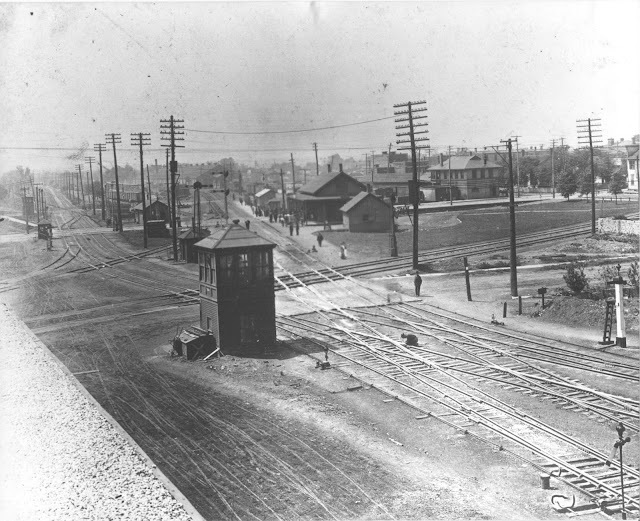 This is the interlocking tower in downtown Joliet, circa 1900, before the tracks in Joliet were elevated and relocated. This photo was taken from the roof of the Joliet Warehouse & Storage Company building, looking southwest. The tracks running from left to right directly behind the tower belonged to the Chicago, Rock Island & Pacific Railroad. The tracks running from the lower right to the center background belonged the Chicago & Alton Railroad. The building in the center was the Chicago & Alton Railroad passenger depot. The tracks running from the lower right side of the photo to the background on the left belonged to the Atchison, Topeka & Santa Fe Railroad. In the background on the left were the tracks of the Michigan Central Railroad's Joliet Cut-Off. 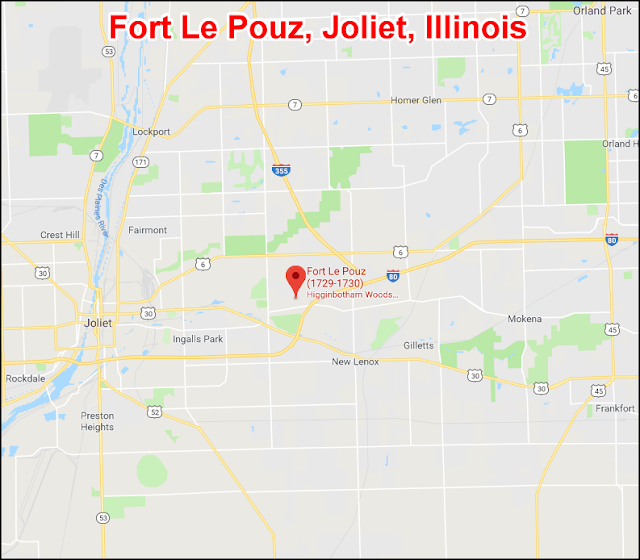 The Old French Fort, as it was known to early Joliet settlers, was originally called Fort Le Pouz and was built in the fall of 1729 by Lt. Nicholas Antoine Coulon sieur de Villiers, the commandant of Fort St. Joseph in Niles, Michigan. It was one of about 75 New France forts designed to promote the French fur trade in the Mississippi Valley, to provide over-night shelter and protection for inland travelers and traders from the Mesquakie (Fox) Indians who were at war with the fur traders in the Great Lakes region, mostly in today's Michigan and Wisconsin, from 1712 to 1733. The fort was staked out by people with a compass, or at least an accurate knowledge of direction; perhaps by accident as it stood true with the north star. It was not a large fort, or stockade, as it contains less than an acre of ground. In a 1926 the walls were mounds of earth about two or three above the forest level and the ditches not more than two or three feet below. A.J. Mathieson [or Mathewson] surveyor, of Lockport, Illinois located excavations of supposed magazines, wells and underground shelters in the late 1830s. The fort is believed to have been burned down by the French themselves in 1730, along with other fortifications in the area, to prevent their use by Potawatomi and Sauk Indian tribes. Fort Le Pouz was found in the east part of Pilcher Park (320 acres) which was previously known as Higginbotham Woods (239-acres) owned by early settler Henry D. Higginbotham, and before that it was called the Big Woods. A 1970s map of Higinbothan Woods (note the spelling), now Pilcher Park with (F) marker being Fort Le Pouz; a replica which was dismantled somtime in the 1980s. The exact location is, 500 feet west and 75 feet south of northeast corner of the west one half of the southeast fourth of section 8 in Joliet Township (T. 35 N. R. 11 E.). Fort Le Pouz was in the northeast corner of the Higginbotham woods which was untouched by the axe until 1918 when it was stripped. 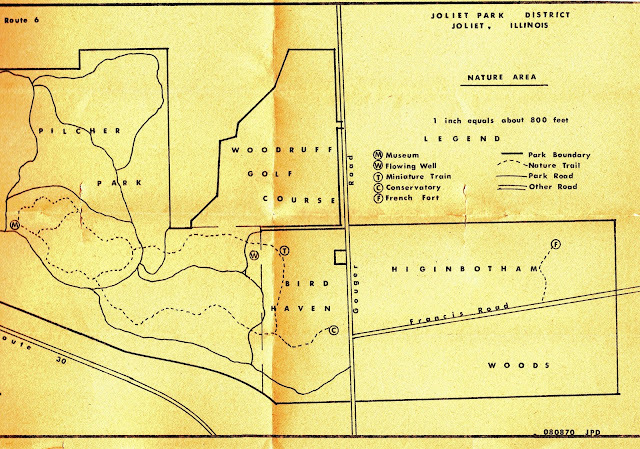 The Higginbotham property was deeded to the City of Joliet for a park in 1920 or 1921. The Forts of Palos, Illinois. Investigations into two fortified sites near Chicago. 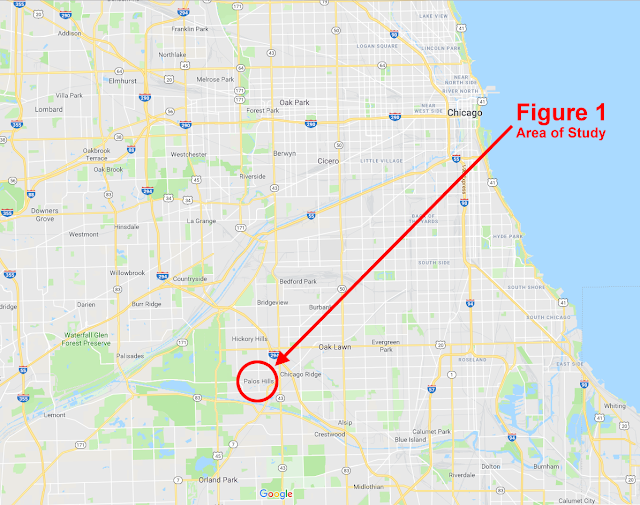 In the 1830s, the remains of earthwork fortifications were discovered in what is now Palos Hills, Illinois (a suburb some eighteen miles southwest of Chicago). The forts were located atop a bluff overlooking what was once the old Ausagaunashkee Swamp, a vast, reed-choked marsh that had once stretched from the Desplaines River eastward to the Calumet River. While local legend contends the forts were the work of the French explorers (a belief that conveniently explains the presence of fortifications in an area having no known military history), who built these works, when, and why are questions yet to be explained adequately. By about 1904, farming and other inroads of civilization had erased the physical features of the earthworks, and their precise locations became as clouded as their origins. 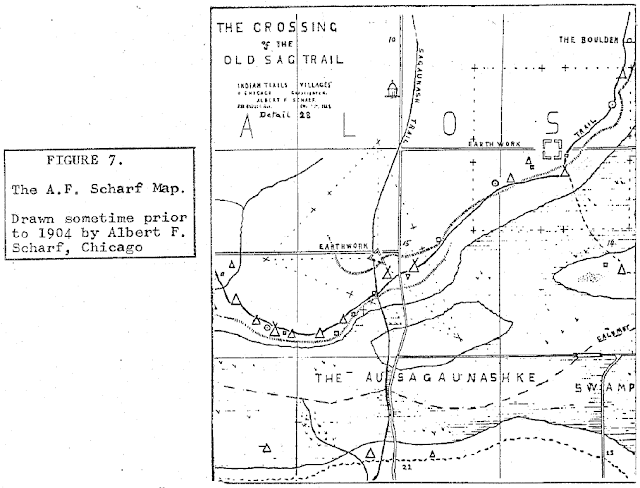 "This is to point out the locality or the remains or an old Fort located in the town or Palos, Cook County Illinois, at the crossing or the old Sag trail, which crossed the Ausagaunashkee Swamp, and was the only crossing available East or the Des Plaines River prior to the building of the Archer Bridge in 1836. The remains of the fort situated near this crossing were to be found on the elevated timber land, commanding a view of the surrounding country, and as a military hold would well command and guard the crossing; who built this fort I have never been able to find any account of it in any historical works I have had access to. I first saw it in 1833 and since then visited it often in company with other persons some of whom are still alive. I feel satisfied it was not built during the Sac War from its appearance when I first saw it, and that it may have been built by the Old French explorers who are known to have visited this region of country two centuries ago and more, is more than probable from circumstances connected therewith, in my mind, tending to substantiate that fact, the strongest evidence being the growth of trees a century old being found growing in its environs. It was evidently the work of an enlightened people skilled in the science of warfare. As a strategical point it most completely commanded the surrounding country and crossing of the Swamp. 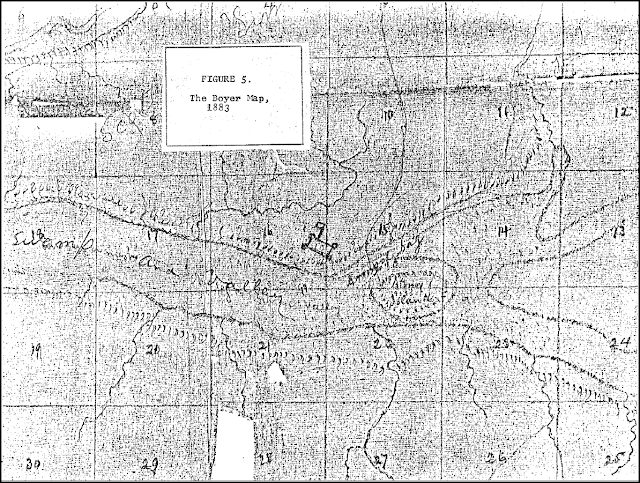 Dr. Boyer’s crude map (Figure 5) showed a figurative representation of a fort on the line between the SE 1/1 of section 16 and the SW 1/4 of section 15, Palos Township (T37 N., R12 E. of 3rd P.M.) [for simplification, this location will be referred to as SITE A; see Figure 2]. His supposition that Frenchmen built this fort unfortunately became "fact" in the minds of many throughout the years, thus inadvertently spawning a French "heritage" that has yet to be proven. Early Chicago Historian A.T. Andreas wrote in 1884: "There is in the town of Palos the ruins now clearly discernable or what were once evidently French or Indian fortifications. These ruins, which are situated on the Farm of Theodore Lucas, some three miles southwest [actually southeast] of Willow Springs, are yet so well preserved as to enable one to clearly trace their former extent and size. From their location on a rising piece of ground, and the area they once evidentially enclosed, the conclusion is arrived at that they were of considerable importance and well-designed in their construction For affording refuge and protection to a large number of persons. As to who built them, no one knows… The Fort was located in the West half of section 15, town of Palos, on the Farm of Theodore Lucas." Andreas also quotes the Boyer letter elsewhere in his book. At the close of the 19th century, interest in area archeology was also emerging, with some primitive archeological surveys of the area taking place. Conducting one such survey was Karl August Dilg, whose notes mention "the remains of a former cabin or stockade fort dating back to the French period.” He states this feature was "West of the Sag Indian village,” however he also makes a margin note to the effect that the features he was describing were in Palos Township; this would place them, in point of fact, east of the Sag Indian village, not west. Dilg's papers are not very precise and his conclusions often misguided. On the other hand was Albert F. Scharf, a German immigrant who, from the time he arrived in Chicago as a boy in 1853 until his death in 1929, spent a great deal of time traveling Cook and Will counties talking to farmers and long-time residents, visiting, recording, and mapping Indian sites; his volumes of notes written over the last Quarter of his life form an early archeological survey still used by archeologists today. Archeologists I have talked and worked with have found Scharf's placement of Indian sites to be quite accurate, although some of his writings get a bit romantic. Of the Palos fortifications, Scharf says: "The ruins of this supposedly French fort in section 15, town of Palos, Cook County, first described by Dr. V.A. Boyer, were found in the same condition in 1837, by A.J. Mathieson [Mathewson], of Lockport, Illinois. But Mr. Mathieson says there were two forts, the other being similarly situated one mile to the northeast in section 14 of the same town. Ruins of a French fort, or stockade, were also found in section 8, town of New Lenox, Will County, Illinois. Of the original formation of these ruins, Mr. Mathieson can give an accurate description, having surveyed and platted them at that time. To some extent, the first two mentioned can be traced today, but the last mentioned one is well preserved and covered with timber. The location of the Mathieson ruin (1837), is in the northeast corner of the northwest quarter of sec 14, town of Palos, on the farm of Mr. Theisen. This ruin Mr. Mathieson says was an earthwork in the form of a square, true to the points of the compass, and having four Sally Ports. Both or these ruins are well known to the early settlers…"
A triangular earthwork, the point of which directed toward the water, was located just where the Ausaganash trail crossed the swamp this earthwork had openings in each of its three sides. It also has long since disappeared." 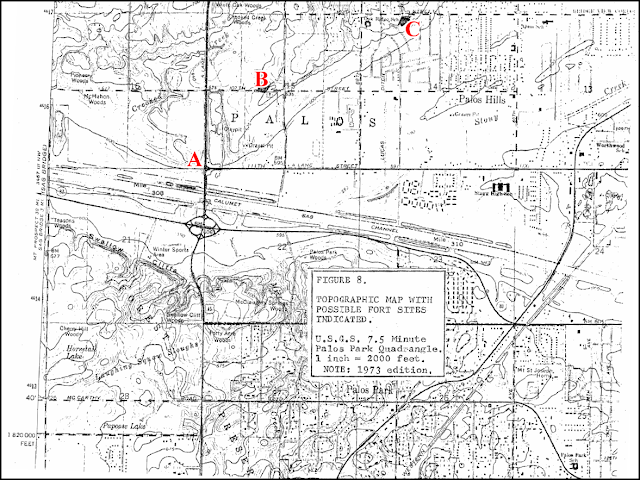 Scharf's map, "Crossing of the Old Sag Trail,” detail 28" (Figure 7) shows a triangular fort on the N.E. quarter of the S.W. quarter of Section 15 extending slightly into the S.E. quarter of the N.W. quarter of the same section, Palos Township. 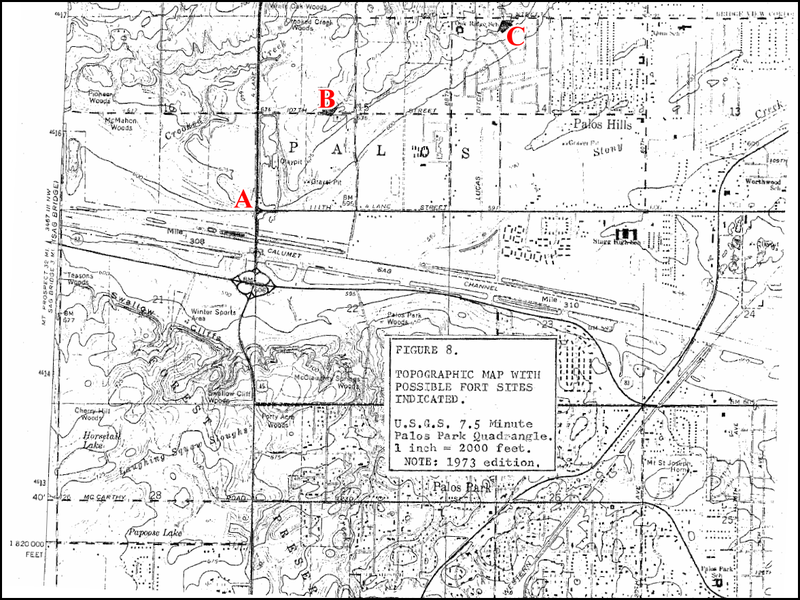 [This fort is referred to as SITE B (see Figure 2)]. The map also shows a square fortification on the border between the N.W. quarter of the N.W. quarter of Section 14 and the S.W. quarter of the S.W. quarter of Section 9, same township [this fort is referred to as SITE C]. It should be noted that the locations shown on Scharf's map do not jive totally with his written descriptions; in both cases, the map figures are shifted slightly (perhaps a matter of yards) to the north of the locations described in his writing. This is probably because the size of the forts on the map was exaggerated somewhat for the sake of illustration -- artistic license -- and would therefore take up more space than if drawn to scale. Although (assuming momentarily they are drawn to scale} forts of this size may have existed, they would probably have received more attention in historic record. 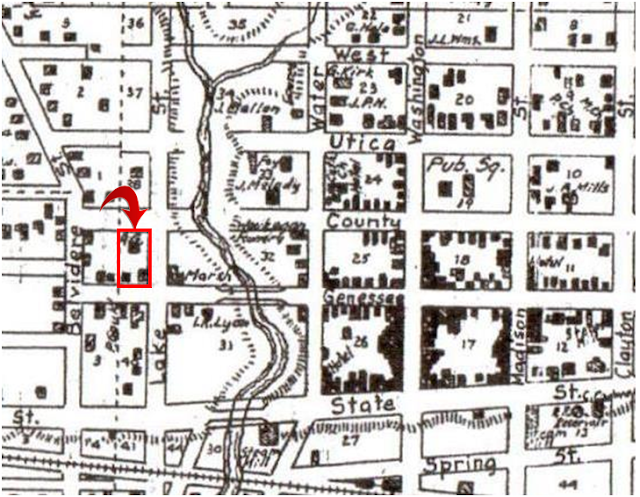 Although the map is undated, its drawing can be placed sometime prior to 1904 by Scharf's placement of Sacred Heart Church on Kean Avenue in Section 10. The church at that location burned in 1903, and was rebuilt in 1904 on or near where he shows the triangular fort [SITE B]. Scharf would surely have noted this had the building been there for a while. Scharf's notes mention interviewing "A.J. Mathieson" at the man's office in Lockport, Illinois, in 1903. Other details gleaned from Scharf indicate that his Mr. "Mathieson" must have, in fact, been Artemus Julias Mathewson, a civil engineer and official with the Illinois-Michigan Canal commission and (at times) County Surveyor for Will County. In 1837 (and later), Mathewson was involved with work on the Calumet Feeder (a channel cut through the Sag swamp to provide additional water to the I&M Canal) and would certainly have been familiar with the Palos area. 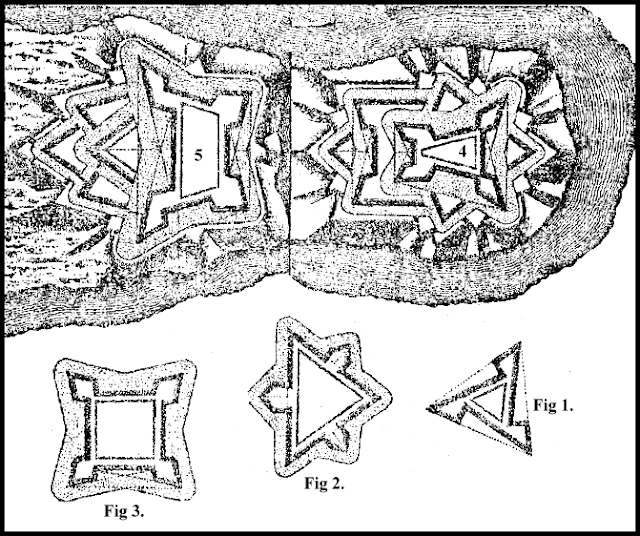 Scharf says Mathewson surveyed and platted the earthworks in sections 14 and 15, and that he willed his papers to his grandson Arnold (Figure 3). In a conversation with a member of the Illinois & Michigan Canal Museum staff in 1975. Following Mathewson’s death, a legal dispute arose over who had jurisdiction to his papers, the result apparently being that his Canal and government-related papers were eventually split between the I&M Canal Museum, the Illinois State Archives, and possibly some other offices, while his private papers -- if any actually existed -- would have been retained by the family. In short, his papers were scattered. 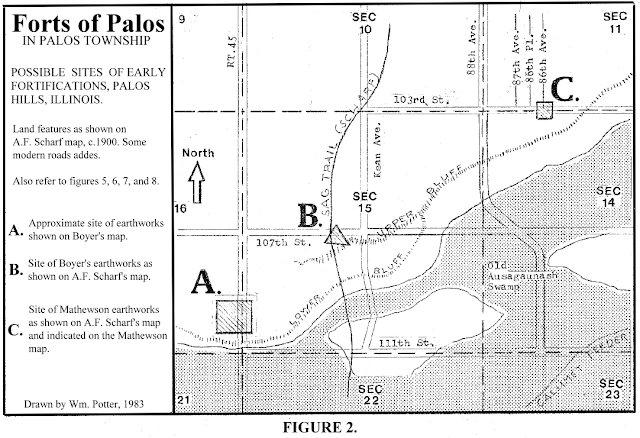 The Mathewson papers at the I&M Museum consist mainly of his survey notebooks for the Canal proper and have no direct relation to the Palos area. 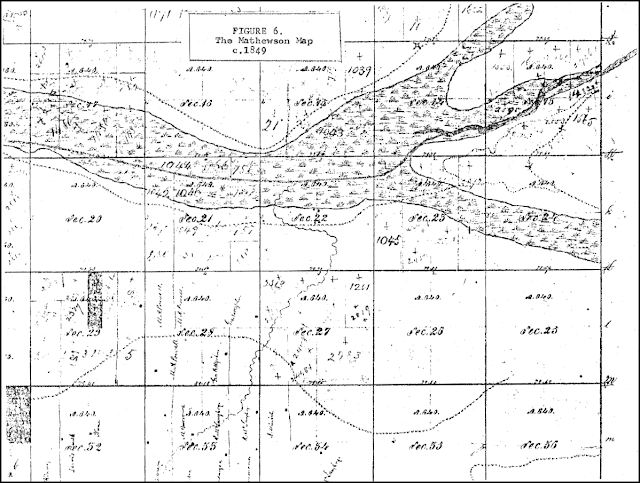 At the Illinois State Archives, however, Director John Daly was able to turn up Mathewson's survey and plat notebook for the Calumet Feeder dated 1849 (at which time the Feeder was already operational), as well as a Mathewson map of Palos Township delineating the Feeder route through the Sag swamp. The survey notebook reveals nothing related to the fort sites. However, near where the Scharf map shows the "Mathieson" fort [SITE C] in section 14, the Mathewson map shows a peculiar (and unexplained) symbol resembling a hollow, four-pointed star. 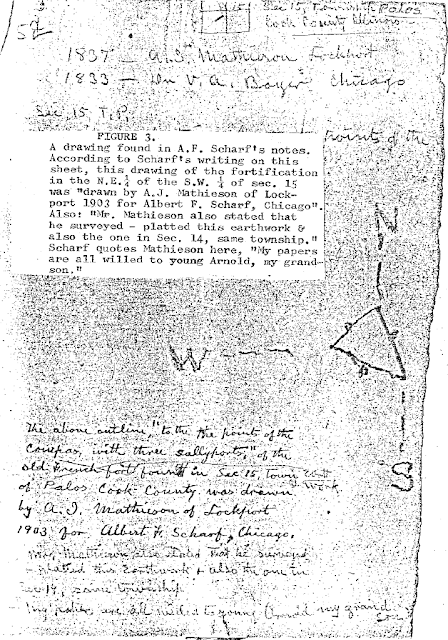 Although it could be some sort of surveyor's marking, this symbol does not appear anywhere else on either Mathewson's map or in his notebook; it’s not a coincidence that this mark should appear where it does, especially considering Scharf's contention that Mathewson had surveyed the forts. On the other hand, though, nothing of note appears in sections 15 or 16 (where the "Boyer" earthwork could be expected to turn up) on this map. Mr. Daly added that the notebook and map were all the related Mathewson material on file at the Illinois State Archives. If Mathewson did make more extensive drawings of both sites, they are either lost to history or with some unknown descendant. ···It is more than likely that the original French Fort at Chicago (Is Fort Chécagou a myth?) was located at Palos. There is today a Roman Catholic Church on the crown of the hill, just above the fort." The Catholic Church referred to here was Sacred Heart Church (now the Sacred Heart-Chapel Hill Newman Center) -- the one built in 1904 at Site B. However, a pamphlet published by the Sacred Heart Parish in 1933 mentions "…the local tradition to the effect that the old French Fort stood on the Lucas farm, a few feet from our present Church." In addition to the above references, there was an interview with Ann Busch Wilson. Mrs. Wilson is the daughter of Charles J. Busch, one of the Busch/Lucas clan mentioned in Scharf's notes. The Busch and Lucas families were among the oldest in the area. Ann Busch Wilson was born around 1907 and grew up on her father's farm located at Site B just west of the Sacred Heart Church building previously mentioned. Mrs. Wilson stated her father had told her that a fort had existed on their property west of their house. She and her son, Mark, recalled that visitors often came out to look around the farm (probably for artifacts), but usually searched near the bottom of the hill south of the buildings. Also interviewed was Mrs. Clara Thiesen Kueltzo, who grew up on the Thiesen farm mentioned by Scharf in relation to the "Mathewson" earthworks in section 14 [SITE C]. Mrs. Kueltzo referred to the fort as the “Indian Fort" and said it was located where the Palos Hills City Hall stands today. She also stated all traces of the fort had disappeared by her time. Clearing up a local legend, she said that a log cabin once standing on the site was the Thiesen homestead and was not part of the fort as some old residents claimed. (The cabin was razed in the 1950's, although Mrs. Kueltzo now wishes it had been saved. The Palos Hills City Hall is south of 103rd Street at 86th Avenue [SITE C] -- a few yards south of where Scharf's map shows one of the forts to be, and almost exactly where the Mathewson map indicates something. Were there actually two forts? Before 1900, farms in the area surrounding the Sag swamp were few and far between, therefore much -- if not most -- of the area discussed here was covered with dense brush and timber. And, it may be added, with the coming of the Cook County Forest Preserves, much of the area has been restored to that condition today. 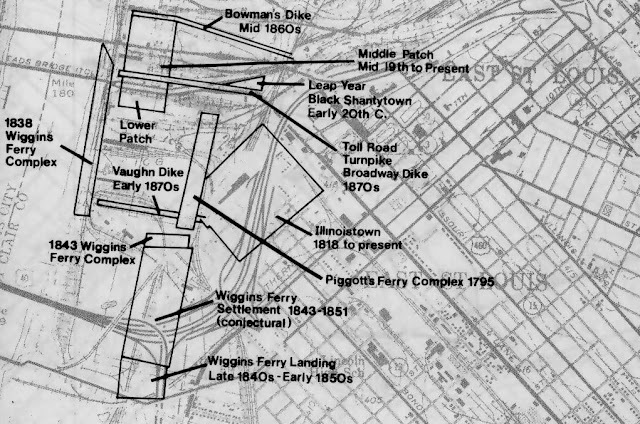 Boyer's visits were concluded before there were any real landmarks, and he attempted to pinpoint the site using a map long out of date, even in his time. Wandering through miles of underbrush, it is quite believable he and his contemporaries would not have found another fort unless they knew it was there. It is even conceivable some parties may have seen (at different times) both sites yet not realize they weren't the same one. The only man who actually saw the two different works (in their entirety) on two different sites was Mathewson, and on that fact we must trust Scharf's account. Mathewson was a trained engineer who must have spent much time on the bluffs of the Sag while surveying the Calumet Feeder route. Perhaps he is the only early visitor to the area to realize there really were two fortifications. Mathewson would also have been capable of determining and remembering the planform of such works. Scharf himself seems to have briefly seen only bits of two forts before their visible features were forever leveled by "progress." According to members of the Lucas-Busch family, their ancestors (who occupied Site B -- the Boyer/Scharf site in section 15) may have looked on such ancient works with curiosity, but would not have hesitated to level them if they stood in the way of plowing or other projects. Perhaps the Thiesens of the section 14 site [SITE C] felt the same way. A.F. Scharf came along just a little too late and therefore was dependent on Mathewson for his descriptions of the works as they were. I believe Scharf's map exaggerates the size of the forts for the purpose of depiction, but is accurate in placing the sites (within, perhaps, a few hundred feet). Taking into account references made after the sites were erased (but while people who had seen the features -- perhaps even those responsible for their leveling -- were still alive), as well as statements made by descendants of the owners of the sites, it is fairly certain there were indeed two separate earthworks forts found in Palos. Their probable locations being Site C -- the Palos Hills City Hall/Green Hills Library property at 86th avenue and 103rd street (the "Mathewson" fort, NE 1/4 of NW 1/4 of Section 14, formerly the Thiesen farm), and Site B -- west of the Sacred Heart/Newman Center at 107th street and Kean avenue (the "Boyer/Scharf" site, NE 1/4 of SW 1/4 of Sec. 15, formerly the Lucas-Busch farm). However, the original "Boyer" site as shown on his 1884 map [SITE A] should not be totally ignored, for archeologists found some items there that could possibly be fort related. SITE A - Boyer’s depiction of the fort (rectangular walls with corner bastions and a flag, no less) on his map was for the sake of illustration only, and the works would have to have been of grandiose proportions if drawn to scale. While it is probable Boyer missed his mark slightly in placing the site where he did, it still deserves some consideration as a legitimate location. Today the site is owned by the Cook County Forest Preserve District; it is on a high bluff overlooking the Calumet Sag Channel and the Sag Valley (once the Sagaunash Swamp). The valley forms a narrow neck at this point. A great portion of the hillside along the north-south section line was entirely removed for the construction of the four lane Route 45. The adjacent area in section 15 was completely removed by a deep gravel quarry operation, only to be refilled as a garbage dump or "sanitary landfill" (the ground contours you see today are original, only the artifacts have been changed). On the west side of the highway cut, the land is more or less at its original contour, forming the bluff extending westward into section 16. There was an Indian village on this site (the Palos Site, Illinois Archeological survey# 11-CK-26); it was partially excavated by members of the Chicago Field Museum Summer Archeology Program in the late 1960s and early 1970s. Although the site proved to have had longstanding intermittent occupation the bulk of the artifacts were of the Upper Mississippian culture, Blue Island subculture, with some items definitely assignable to the Early Historic period; the principal occupation was figured to the late 17th century. Along with Indian artifacts a limited number of European trade goods were found, including 17th century beads, a 17th century "Jesuit" ring (found on the finger of an 18 year old male skeleton), and a silver musket trigger guard tentatively identified as 18th or possibly 17th century French. Also found was a possible clasp knife and a few brass fragments. Of particular interest was a mass burial of 13 men, women, and children ranging in ages from 1 to 58; all appeared to be buried at one time with little order. Although no marks of violence were apparent, many body parts were missing. Archeologists believed this to have been the spring burial of dead accumulated over a particularly devastating winter; this certainly makes sense, although there is the possibility that, if some sort of foul play had occurred, no evidence may have been left on the skeletal remains found. Traces of a previous farm also are present here. SITE B - This site is also owned by the Forest Preserve District, although the eastern portion may be under the control of the Sacred Heart Newman Center, whose building is on part of the possible site. About ½ mile northeast of the Boyer site, this one is on an upper bluff overlooking a lower bluff (the remaining beachfront of the Calumet Stage of Ancient Lake Chicago). West of the old Church is a small asphalt parking lot. West of that is the overgrown remains of the Busch farmyard, where bits of old buildings are evident. Since the majority of these buildings were constructed before earthmoving Equipment was in common use, it is possible that soil disturbance was kept to a minimum, excepting the machinery used by the Forest Preserves during building removal and during mass tree-planting operations. Previous archeological investigation of this site is not known at this point. SITE C - Also situated on the bluff-top approximately one mile northeast of the Boyer/Scharf site; no original ground remains in this area, having been completely recontoured during various periods of construction in the late 1960s and early 1970s. The exception is a narrow strip of land (about 20 by 75 feet) between the City Hall and the Library; this piece is believed to be at its original level (although there may be some soil disturbance -- including the burial of a "time capsule" in the form of a burial vault), and seems to be about dead center in the possible fort site. The site is immediately adjacent to the Knoll Springs - Ausagaunashkee Indian village site (IAS 11-CK-19) excavated in the 1960s by archeologist Charles Slaymaker III of the Treganza Museum of Anthropology in San Francisco, California. This site, like 11-CK-26, was a long-used village area with a principle occupation by the Upper Mississippian culture, Blue Island subculture, early in the Historic Period (Slaymaker estimated a period pro-1750). Among the European-related artifacts found were a musket ball of .51 caliber (unfired, sprue attached), an iron arrowhead, a brass strip, and clay pipe fragments. Four well-ordered burials in two different areas were found. The entire site was not excavated. There are a few other matters relating to the forts of Palos that should also be mentioned since they may or may not have some bearing on the issue. In 1963, three children were playing in a freshly-cut ditch at 87th avenue and 103rd street (west of Site C, see Figure 2) when they found three "cannonballs" partially imbedded in the clay bottom of the shallow ditch. This spot was about one block from the supposed site of the square "Mathewson" earthworks in section 14 -- just beyond reasonable musket range, but still well within the bite of a small cannon. Unfortunately, an iron ball is an iron ball, and it is impossible to tell an industrial iron ball (intended for use in a ball mill) from a cannon ball unless there is some marking cast into the latter, such as the French fleur-des-lis, an English broad arrow, or a lettered U.S. mark. Such markings were often cast or stamped into some (but by no means all) shot for each of these nations. None of these marks are present on the balls in question. The three balls are of two calibers, one measuring 2.100 inches, the two smaller ones measuring 1.543 and 1.550 inches. It is very interesting (but certainly not conclusive) to note that the theoretical standard size of ½ pound shot listed by the English Ordnance Board in 1764 was 1.52 inches, while another English shot table of 1780 shows 1½ pound shot to be (theoretically) 2.201 inches. Both of these calibers (plus or minus a little) were in common usage by many nations in the 17th and 18th centuries, usually in the small, relatively portable cannons called "swivel guns." It would appear these balls are within what may be considered allowable manufacturing tolerances for ammunition of this period, as artillerists always called for a generous amount of "windage" between ball and bore to prevent accidents caused by irregular shot Jamming in the barrel on firing. Perhaps the similarity in sizes to these calibers is a coincidence, perhaps not. It must also be mentioned that certain types of Civil War shot (notably 12 pounder Grape and 12 pounder Cannister) come close to these sizes, making it possible (though not probable) that someone's war souvenirs may have found their way into the ground there. We may never know. "Thomas KeIIy, a farmer living in Section 18, says that in some researches he has made among the ruins of the Boyer/Scharf fort, [SITE B] not long since, he found a number of relics, among which was a curiously wrought powder horn, evidentially of an antique pattern, and having on its surface inscriptions in a language which he was unable to read. Here, on the Charles Bush/Theodore Lucas farm in the southwest quarter of section 15 is where Thomas Kelley, of section 18, Town of Palos, dug up Indian relics and a powder horn (Copper flask, found in section 18, as related by his son John. [Scharf's note]). At 107th street in section 18, Mr. Thomas Kelly in 1856 found a pair of metal soles, such as the French soldiers wore in olden times, and he discovered the skeleton of a man with an ancient French gun and copper powder horn with the makers-mark of 'Frary Benham & Co.' etched upon it." It is somewhat distressing to note how the amount of information regarding the Kelly finds grew over a span of decades. Perhaps all of the items attributed to Kelly were in fact found, or maybe the stories about the finds were embellished as they were retold over the years. The source of Sinnard's information in unknown and thus one cannot judge its validity. However, taking all of the reported Kelly finds as gospel; Andreas and Scharf differ on where the powder horn/flask was found, while Sinnard was noncommittal. I am not familiar with metal shoe soles being found at other fort sites in America, but, considering the drastic wear put on leather shoes by foot soldiers through the centuries, it would not be surprising to find such an expedient in use somewhere. It is very unlikely a powder horn could have survived very many years exposed to the weather, but a powder flask made of brass or copper is another matter. 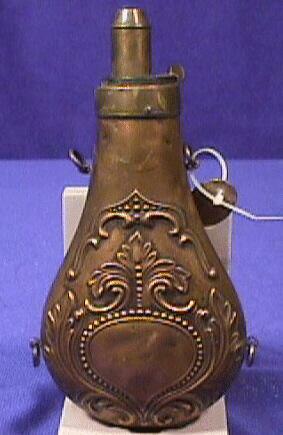 Many armies over the centuries used such flasks at various periods. forming American Flask & Cap Co. of Waterbury, Connecticut in 1857. They made flasks until 1890. Concerning the "ancient French gun," there is seriously doubt that anyone but an expert on colonial guns could pick up a musket that had been buried for perhaps a century and reliably identify it as French, especially considering that many United States military arms up through the early 1800s were patterned after certain French weapons. If the skeleton accompanying the gun did exist (and it is certainly fishy that the first known mention of both comes nearly a century after their purported find), it is clear the man died alone, for otherwise his belongings -- especially a gun and powder -- would not have been left with him. However, Indians did occasionally bury firearms with their dead; such burial guns were almost always either missing key parts or deliberately broken, possibly to discourage others from coming back to dig them up. We do not have enough information to judge if this might be the case here. Another persistent legend mentions caches of French and Spanish coins being found in the vicinity; these legends are occasionally trotted-out to "prove" the French (or Spanish) origins of the forts. It is strange that (if such coins really were found) no one bothered to record their dates. It is also slightly improbable that any soldier of the 17th or 18th century -- French, British, Spanish, or whatever -- would even have enough coins to make a "cache," let alone carry them miles into the wilderness and bury them. If foreign coins were found in the area, their origins probably date back to one of the periods in the 1800s when shortages of "hard" money made usage of foreign coins common, or when immigrants from many nations began to settle the area in the 1840s or passed through heading westward. Many longtime residents claim to have dug up "French" lances, "French" guns, etc., in days long passed; it would appear that every piece of rusty metal a farmer ever hit with a plow around Palos was a "French" something -- and possibly they were! But, as far as it’s known, such items have never been brought forward for examination, and probably no longer exist -- if they ever did. The one exception is a possible sword discovered by a Mr. Max Dunlop while working in his yard in 1969. Mr. Dunlop lived about one third of a mile east-northeast of the Mathewson fort site [SITE C] in an area that would have been on the edge of the Sag swamp many years previous; the fort site would have overlooked the future location of the man's house. The "sword" was displayed shortly after its discovery. It was very crude. It had a straight blade, no taper, about 18 inches long; it appeared to have been made from a piece of strap steel or iron of rectangular cross section (not triangular) and had a rounded -- not pointed -- tip. It was unknown if it had a cutting edge or not. The handle was crudely wrapped with wire (probably over a piece of wood) to form a grip, and it had a knuckle guard made of steel or iron rod pounded flat on bottom end and drilled to accept what appeared to be a common screw which was sunk through it into the handle lengthwise. The consensus of opinion was it was either a homemade toy or a makeshift machete for whacking weeds. Swords of similar size, referred to as "fighting knives," are known to have existed, but configuration of these seems to have been far more "sword like" and of better quality. Even so, there may always be some doubt, since no one thought to photograph Mr. Dunlap's crude sword, and he has since moved away. The "sword" probably no longer exists. THE PALOS FORTS: WHEN AND WHY? Aboriginal village fortifications: blaming these forts on the Indians is the easiest route to take, and in many ways the most logical. Various Indian cultures did build earthworks forts; some, such as the Mesquakie (Fox), even built theirs in a similar manner in the historic period. Square or round Indian forts seem to be relatively common in the Midwest, but that triangular fort at Site B poses a problem. Archeologists I have talked with to date could not recall any other examples of triangular Indian forts in the Midwest. If such forts aren't totally absent, they are at least rare. Take a look at Figure 3 (the sketch of the triangular fort drawn by Mathewson for Scharf in 1903), then take a look at Figure 4 (a drawing of common field works or redoubts from a 1780's manual on fortifications). Is their similarity totally coincidental? And then there's the problem of the "cannonballs" found near the site of the square fort in section 14 [SITE C]. Perhaps they had nothing to do with the earthworks, in which case their presence is a remarkable coincidence. But it is certain that, if they were cannonballs, the Indians sure didn't leave them there. Although the very circumstantial evidence introduced above by no means disproves possible Indian construction of one or both fortifications, it certainly points out the folly of hastily labeling them as Indian forts and dismissing them as such without further research. Late 17th century French fortifications: Whether or not a French fort existed at Chicago -- particularly Duranteye’s 1685/86 fort -- is a question beat to death by historians years ago, all using the same skimpy references to reach their sweeping conclusions. There is nothing to add, except the thought that no one has yet proven Duranteye (a French soldier) didn't build his fort somewhere in the Chicago area. The arguments against Duranteye having built a fort at Chicago seem to be based largely on interpreting "Chicago" as meaning at the mouth of the Chicago River. But, in centuries passed, the term "Chicago" was also used as a general term for any area near the tip of Lake Michigan, not necessarily an exact location. For this reason, this period should not be dismissed, but no conclusions should be drawn unless some positive documentation surfaces. Forts guarding a possible portage route: Authors like Zeuch and Knight (Location of the Chicago Portage Route) have tried to set the Chicago portage route in stone, while an occasional maverick like Henry Lee has taken much of the same raw material to show something different. Was the Sag a portage route? The Sag swamp doesn't start appearing with any consistency on maps until the 19th century; in addition, early names for the Sag, such as Tall Grass Valley, Grassy Lake, Reed Lake, etc., do not produce visions of easy passage through its midst. However, one must not overlook the comments of James M. Buckin, another early I&M Canal engineer, who (in the company of the famous Chicago half-breed Billy Caldwell and one other Indian) did a preliminary survey in 1830 for a possible canal route through the Sag. He stated: "The Indians further assured me that in certain seasons of high water there had been a water connection between the Desplaines and the Calamic [Calumet River] through the valleys of the Sauganash and Stony creek." It is most likely that there was not one portage route at Chicago, but several, their use being governed by factors such as the season, the weather, etc. There was no big sign in Lake Michigan saying "Turn here for Portage." In short, any route between Lake Michigan and the Desplaines or Illinois rivers became a portage if somebody used it. Although the bulk of the traffic probably used the traditional Mud Lake route, the above information does open the possibility that the Sag (only a few miles south of the Mud Lake route) could also have served at times as a portage route, and therefore the possibility of someone building a fort to protect it -- particularly one covering an important crossing point (possibly the only one for miles) for a north-south trail -- cannot be quickly dismissed. French military field fortifications of the Fox Wars: The French-Fox wars of the early 18th century are particularly interesting in relation to the problem at hand because of numerous expeditions (both Indian and French) through the Chicago area at various times between 1715 and 1732, with several mentions of temporary forts. The French are also known to have used small artillery pieces in some of these conflicts. Also interesting is the fact there were several major battles and skirmishes between the French and Fox-related tribes that occurred in the Illinois-Wisconsin-Indiana area that have not been pin-pointed; even more of a curiosity, a number of battlefield sites are in historical contention for the same battle! One interesting bit of information comes from Clarence Alvord's book, “The Illinois Country.” In discussing an attempt at a coordinated assault on the Fox in the spring of 1728, French troops from three different commands were to combine forces, but the venture was a failure. The Commandant, François-Marie Le Marchand de Lignery, tried to put the blame on the Commander of the troops from Fort de Chartres, Sieur de Liette, who failed to make the rendezvous. According to Alvord: "…Sieur de Liette, accompanied by a Jesuit, Father Dumas, did lead twenty soldiers and as many habitants and some Indians as far as Chicago, where he defeated a band of Foxes and Kickapoo, killing twenty and taking fifteen prisoners, with the loss of one officer and two soldiers." Such an incident could well explain two forts on a seemingly dead-end swamp. The French-Fox wars are nearly virgin ground for historians; only a handful of related documents have been translated and/or transcribed. Perhaps some researcher will someday either prove or disprove the possibility of the Palos forts having anything to do with this series of conflicts. French or American forts of the French & Indian War: I have yet to come across anything indicating military activity in the Midwest during thls period. If anyone has knowledge of such, I would appreciate hearing from them. Forts of the British Occupation: I have yet to come across anything indicating military activity in the Midwest during this period. Although the British did occupy Fort de Chartres downstate, they appear to have been more interested in divesting themselves of the responsibilities of maintaining garrisons in the Illinois country, not creating more of them. I do not know of any military activity in the Chicago area in this period. American or British forts of the Revolutionary War period: This is another interesting period, with troop activity on both sides in the Chicago vicinity. Expeditions of British and/or their French agents to raise Indians in the British cause were in the area in 1779 and 1780; the latter year also saw a full-scale military retreat through Chicago by British-allied forces after their defeat at St. Louis during the British spring offensive. Although a two-pronged assault out of Michilimackinac had been planned, only the force under Hesse -- moving down the Wisconsin and Mississippi rivers -- reached St. Louis; the force under Langlade, which was to travel through Chicago and down the Illinois river, didn't arrive, raising some speculation as to whether or not they may have been holding someplace in route –possibly Chicago -- as a back-up. Hesse's force retreated up the Illinois River to the Chicago area, then back to Michilimackinac. Unsubstantiated rumors of Americans active near Chicago building forts and stirring up anti-British sentiments kept filtering back to the commandants at Fort Michilimackinac; no confirmation of such activities has ever been found. At least one American retreat took place in the area in 1780 following a raid on the British outpost of St. Joseph (Niles, Michigan). The raid was a success but the retreat was a disaster: British-allied Indians and Frenchmen caught and slaughtered the American force somewhere around the tip of Lake Michigan, and only three of the raiders made it back to American-held Cahokia. In 1781, a party of American-allied Spanish also successfully attacked St. Joseph, but made a clean getaway back to St, Louis; it is not known if this party passed by way of Chicago, or if it traveled the frozen Kankakee River. Of all of these instances, it would appear that only Langlade's 1780 expedition would have had time to throw up earthworks. Unknown documents will have to turn up to prove or disprove such a hypothesis. It should be kept in mind that in the previous periods, the term "Chicago" was a somewhat ambiguous term that could mean either the mouth of the Chicago River or anything near the tip of Lake Michigan. American forts of the early Indian wars (late 18th century): I am not familiar enough with this period to comment on possible military actions in the Sag area, although some historians with knowledge of this time period doubted there was any activity here. Forts of the 1812 War: With the exception of Chicago proper (and the Fort Dearborn Massacre), I am unaware of any military actions that could involve the Sag area. Fortified trading posts: There is a remote possibility of such a thing existing here in the 18th century, for small trading posts did exist at other places in the Midwest, but I have yet to find any documentation to suggest this is the case. Although there were some Trading posts in the Chicago vicinity in the early 19th century (such as Laughton's, Friend's, etc. ), it is unlikely they would have created earthworks with "trees a century old" growing in their midst by 1833, as Boyer states. This somewhat effectively precludes later periods. As may be obvious, some of the above possibilities are more plausible than others. The one period that best fits the circumstantial evidence at hand is the French-Fox Wars, particularly Sieur de Liette's 1728 expedition to Chicago. Consider this hypothetical situation: A small band of Fox and other allied Indians, hoping to elude possible pursuers, take refuge on the backwaters of a large swamp. A force of French troops, making their way to join a larger expedition against the Fox, discovers this band. Cornered, the Fox are forced to dig-in and fortify, as was their custom. Nearby, the French throw up a second fort, a field fortification for use as a base or operations by the besiegers. A siege line, or first parallel, is established by the French just outside of musket range of the Indian fort, the French set up their swivel guns and the siege commences. Many Indians are killed; perhaps the Fox attempted to escape and were hunted down and annihilated by the Frenchmen (as occurred during other Fox War conflicts). Delayed by this episode, the French force marches on in an unsuccessful attempt to rendezvous with their main force and, after waiting awhile, content themselves with their own victory and return to their post on the Mississippi River. Several factors neatly fit this scenario: the seemingly European triangular fort at Site B, the proximity of the second fort to the first, the cannonballs lying together beyond the fort at site C, and perhaps even the mass Indian burial at site A. The dating of known European artifacts found by archeologists at adjacent Indian site would be compatible with this period. But there are some problems with this supposition. Although it seems certain there were two earthworks forts, a primary question is whether or not they coexisted. From their similar states of decay, from their similar situations, from their proximity to Indian sites of common culture and period, it would appear (though only through bare circumstantial evidence) the two works do bear some relationship to each other. A weak argument, to be sure. Another problem is whether or not a triangular-planform fort can be considered uniquely white men’s construction in the Midwest; the evidence to that effect is based solely on lack of evidence to the contrary. And if a battle as outlined above really occurred at these sites, why haven't more bullets and such turned up? Perhaps because it never happened, perhaps because no one ever looked for them. It is possible that if the 1728 fight did occur here, it may have been scattered and not centered at any one place. Assuming this fight really did take place here, another explanation for the lack of bullets may be that, in 18th century warfare, the amount of ammo carried and the rate of fire was surprisingly low; a man might -- perhaps fire less than twenty rounds in anything less than a prolonged battle. That, coupled with the small amount of people firing over a vast expanse, makes it unlikely many bullets would turn up. This theory was supported somewhat by an archeologist familiar with the Tippecanoe Battlefield (1811) area in Indiana. Although there had been a major battle involving several hundred soldiers and Indians there, bullets rarely turn up in the immediate area. Needless to say, the above is offered only as informed speculation to explore one seemingly plausible explanation for the Forts of Palos. Far more research (both archival and archeological) needs to be done before the French-Fox War theory can be totally believed. Until that time, the other possibilities dealt with in this article may also have validity and, therefore, should not be dismissed unless proof to the contrary is found. The mysterious forts of Palos did exist, but they are still mysterious. Unlike other historic archeological sites already excavated in the Midwest (where it was pretty well known what was there and what excavation would find), the Palos sites offer a definite opportunity for the relatively new discipline of Historic Archeology to prove its merit and produce useful answers to some challenging questions. On the documentation side of the coin, there still could exist some document awaiting a researcher that would reveal the secrets of these forts. However, if ever it will be determined who built these forts, when, and why, it will most likely come through the combined labor of both the Archeologist and the researcher. Until that time, the origins of the Forts of Palos will remain conjecture.